The best responsive WordPress themes on the market today come packed with so many custom features that often you don’t need to look any further for another web template ever again. You can choose from one-page layouts to full-screen or full-width with just the click of a button, and they all look great on mobile. Why A Responsive Theme Matters? No one wants to go to your website on a tablet, e-reader or smartphone without a mobile friendly interface, and Google is not putting up with it anymore. If your website is not suitable to be read on mobile devices, you are more likely to see problems with your overall search engine ranking. It may not destroy your business, but considering so many people are browsing through phones nowadays, it won’t be long until it does. The mobile age is upon us, and there’s really no reason for you to not have a responsive site. Using frameworks like Bootstrap, Foundation, Skeleton, and Less, developers can target specific breakpoints within a browser so that content is optimized at each breakpoint – forget squinting or zooming in to find that phone number on your cell phone’s mobile browser, now the web is being optimized for you! It only takes a few moments to find a good solution. After that, managing a WordPress theme is fairly simple. But like we said, not all responsive themes are created equal. So, we put together a list of the best mobile WordPress themes for tablets and other devices. There’s not much to look for in terms of responsiveness. After all, a mobile friendly theme is just that. However, we can get a little critical in terms of the design that actually shows up on the mobile devices. For example, some responsive layouts do a great job of consolidating the navigational menu and giving people a chance to reveal it if needed. You’ll also notice that many of the themes snap right into place whenever you bring them up on mobile phones or tablets. Other, less desirable, mobile themes may take a second to adjust and figure out where to shift the elements. Google has recently started penalizing websites that don’t provide mobile versions of their websites, so this is even more of an incentive to get your site revamped for mobile as well as larger browsers. 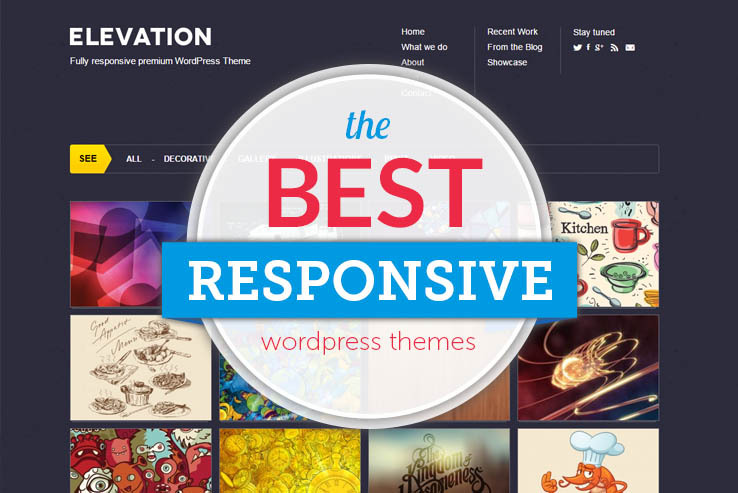 Come browse through our huge list of full-featured, responsive themes the Internet has to offer these days. You won’t be disappointed! 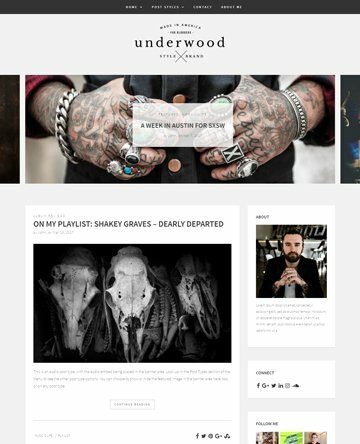 Underwood is a premium responsive WordPress theme designed for personal and lifestyle bloggers who want to present a bold, strong, structured and versatile outlook. The theme is built on the mobile-first Bootstrap Framework so you enjoy a sleek and intuitive design that looks classic on smartphones and tablets as well as laptops and desktop screens. Thanks to plenty of white space, the focus of your readers will be on your content; whether they love text content, visuals, or audio. 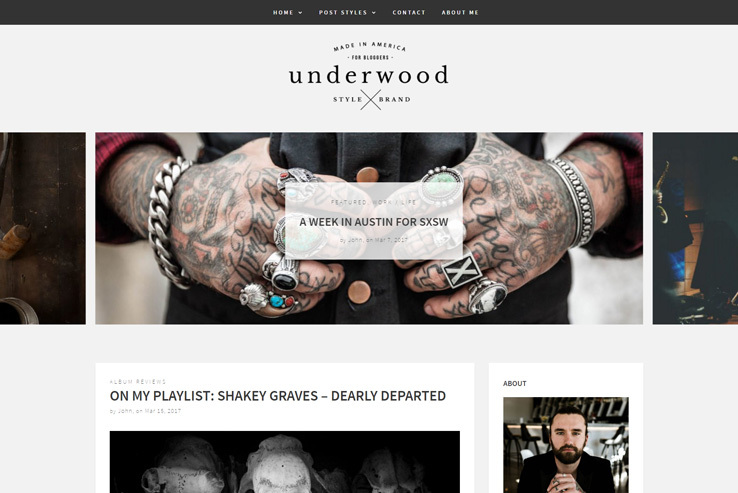 The Underwood theme comes with plenty of easy-to-customize options. Choose among 3 homepage layouts – the standard blog layout with large featured images of your latest posts, or grid-style layouts with the sidebar enabled or disabled. Besides the standard blog post format, you get audio, video and gallery custom post formats – you can choose to enable or disable the sidebar with each of these. Custom widgets offer the opportunity to easily expand your site’s functionality. The user-friendly WordPress customizer offers a true what-you-see-is-what-you-get experience. Add your own site title and tagline, adjust colors, the header image, and front page displays, all with live preview. Other features include ready-to-use Google Fonts, search engine optimized, social media linking, extensive theme documentation, premium support, and much more. 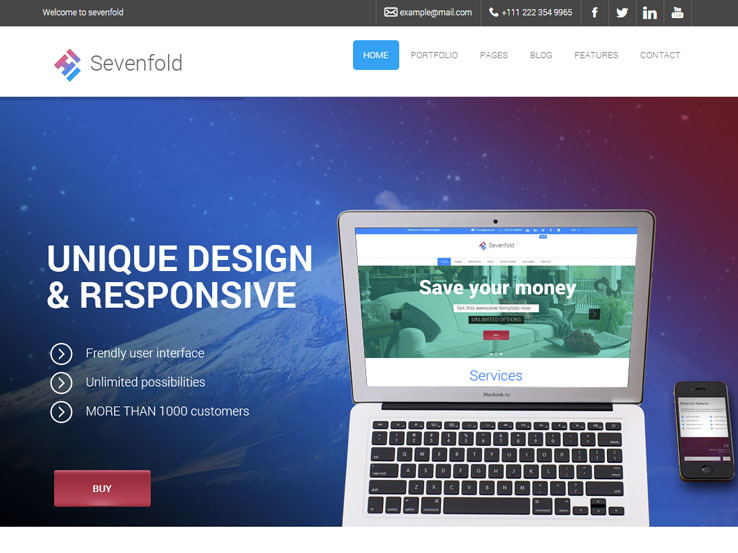 Having a responsive layout is a must for any modern website. 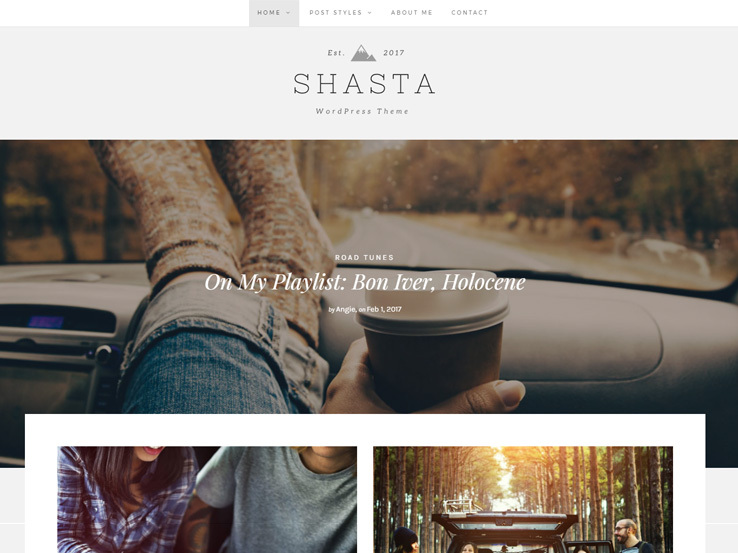 If you are looking for a fully responsive WordPress theme that features a simple, minimal look, Shasta should be one of your top choices. The professional design allows you to put your best face forward, and it looks great on all screen sizes and resolutions. There are multiple homepage designs that you can choose from to get exactly the look you’re going for. Shasta comes with dedicated support for various post formats. You can use these formats to publish regular posts along with audios, videos, and images in different styles. 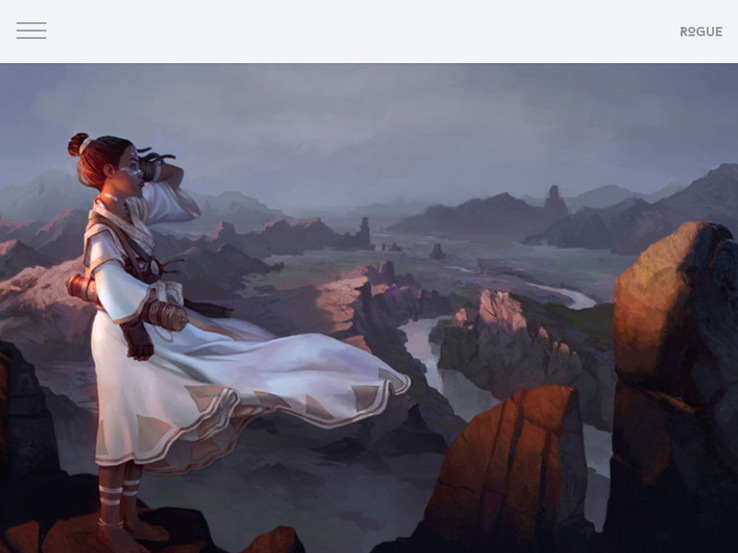 There is a fixed banner on the homepage. It allows you to promote your latest post, offer, promotion, or other important things. The powerful theme customizer section includes all the options to control the font, color, and other display settings. Shasta comes with several custom widgets and multiple widgetized locations. Therefore, it will be a lot easier to show links to your latest, featured posts, social media links, search bar, author bio, and more. The highly optimized coding will complement your SEO campaigns. Full compatibility with WooCommerce enables you to sell your own products, services, or both. 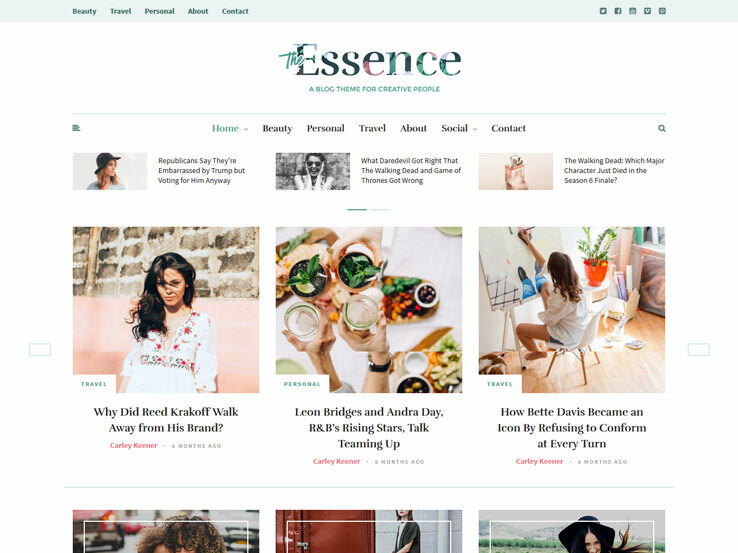 The flexible design of Essence can quickly adapt the layout according to the screen size and resolution, thereby ensuring a great user experience for your readers. They can take advantage of the mobile-ready drop-down menu to navigate to different parts of the website. Put the primary focus on your best contents by adding these to the featured sections. The intuitive social sharing buttons with share count will allow the visitors to share the content from any device they want. Other features like the related content, previous and next posts navigation, live Instagram feed, etc. also work correctly on all screen resolutions. 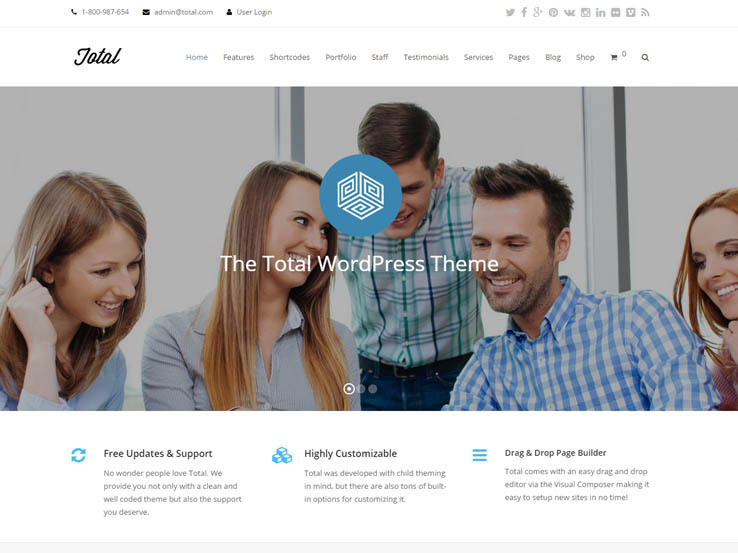 Total is a responsive and modern WordPress theme from the relentlessly dedicated team at WPExplorer. These are the same designers and developers that brought you themes like PhotoPro, Earth, and Office. WPExplorer is known for providing excellent support and superior quality themes. The Total theme epitomizes the wonderful trend in the WordPress theme world towards multi-purpose themes that have such powerful options that they can be transformed into websites for any industry. This theme would work just as well for online stores, agencies, bloggers, wedding planners, lawyers, hosting companies, nonprofits, and more. No matter what industry you are in, the Total theme will allow you to create the website you’ve been wishing for. The stunning layout of Wonderwall delivers an unforgettable user experience even on smaller screen sizes. Each of its nine homepage designs is professionally designed to look great on any screen resolution. The bundled page templates will come in handy to create the essential pages for your site. Convert the visitors into subscribers by using the newsletter widget, or monetize the blog by placing advertisements on the several ad locations. Wonderwall is also provided with fully customized social share and follow buttons that work correctly on various mobile devices. 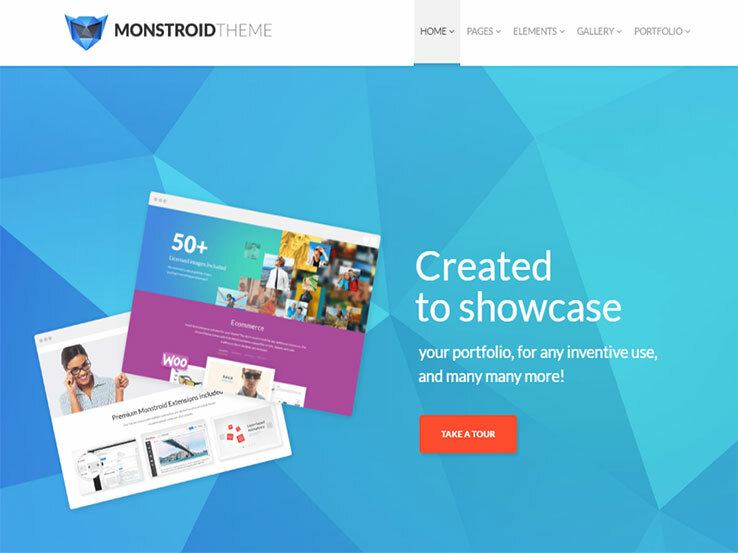 Monstroid is a brand new theme that meets all the requirements of modern web-design trends. It’s more than a theme since it allows you to create the perfect website for your needs effortlessly. It was developed in such a way that both a person alien to technical details and a professional developer will be satisfied with what they get. The theme includes MotoPress editor and 15 other premium extensions, multiple layouts and different style options, exclusive shortcodes, 50+ licensed images and 100+ fully customizable PSD files, eCommerce integration, and lifetime updates. With Monstroid Wizard you will get your theme installed in several clicks. Add to this 24/7 free, lifetime support and you get a perfect theme for any kind of website. 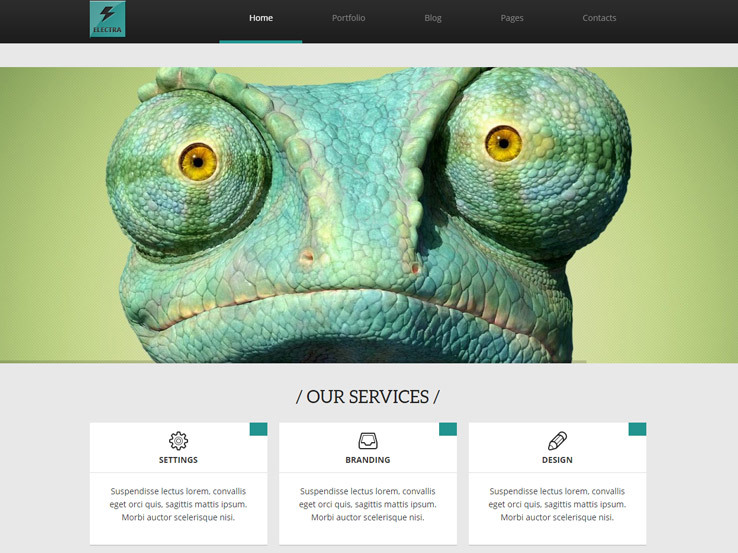 This fully responsive theme can become a perfect representation of your business on the web. The theme uses clean design, stunning typography, and negative space. All these elements catch the eye and make the visitor stay on your site for a long time. Portfolio blog on the home page makes it simple to present your projects and attract new customers. Cherry Framework 4 and Bootstrap-based theme gives you an opportunity to quickly and easily customize the layout to best suit your needs. Various animation elements, parallax effects, and background video make the theme look vivid and interesting. Custom page templates, an easy-to-use admin panel, and advanced theme options help you create a fresh and unique website that fully corresponds to your needs. Drone is an elegant, minimal portfolio child theme for the Genesis framework. 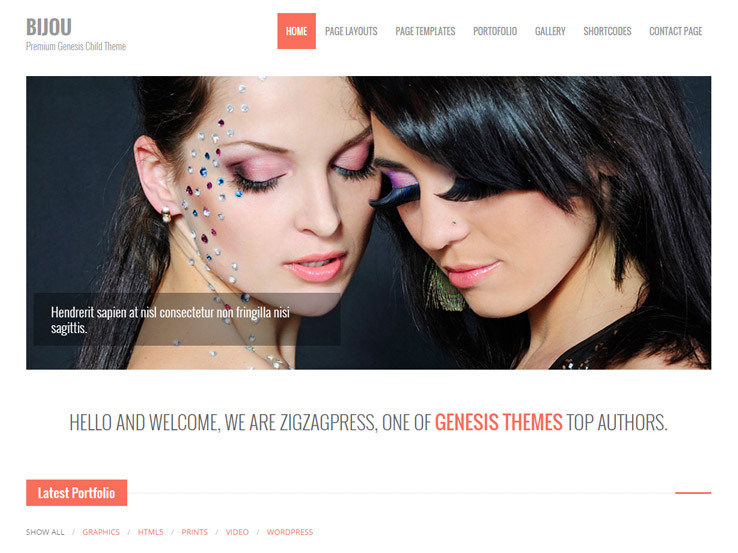 Genesis is the perfect foundation for beautiful themes with a responsive and modern feel. It features a responsive design and a stunning filterable portfolio that makes it easy for your visitors to see the type of work they are interested in. 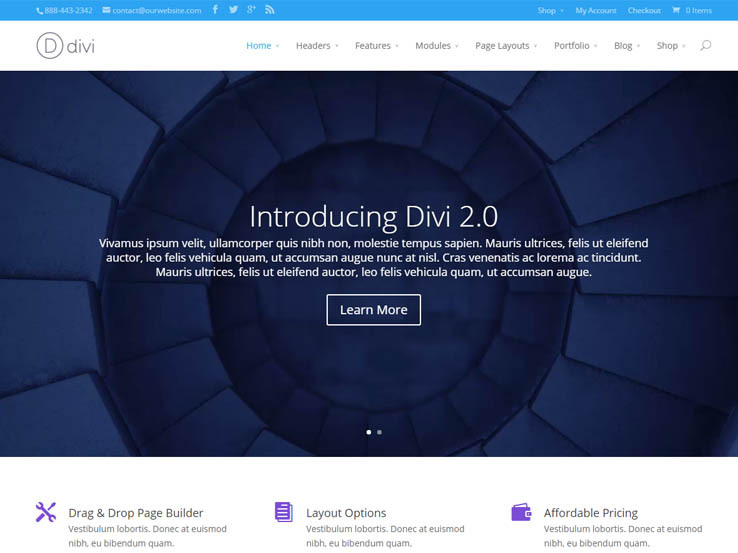 Divi from Elegant Themes is the only theme you need. It comes with a drag-and-drop Divi page builder, premade layouts, and a responsive design. The options are endless – from a portfolio theme to a business or non-profit, Divi is for you! This WordPress theme has everything you need for a stunning online presence. The theme includes must-have sections for a blog and a portfolio. The color palette and flat design look stylish, trendy, and fit the essence of the site. The theme is Bootstrap-based and powered by Cherry Framework 4, which means it is easier to work with. With MotoPress editor it is extremely easy to install and customize the theme. Different animation effects such as parallax make the theme appear unique and fresh. SEO-friendly and multilingual, this theme is a good choice for any kind of business. You can fully redesign the layout of the site and make it unique. 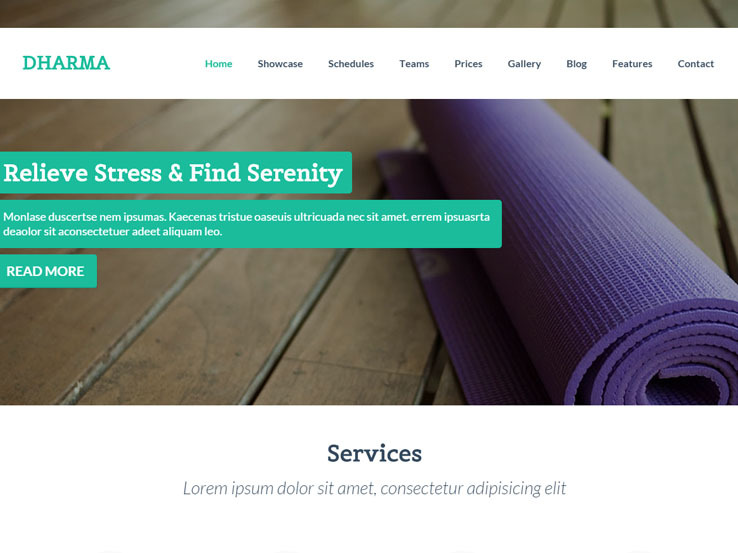 If you are looking for a yoga/spa/fitness theme, Dharma is one of the best responsive WordPress themes on the market. It is built on the Genesis framework and features a class schedule, teacher bios, an awesome frontpage slider, and more. Sevenfold includes the Revolution Slider plugin in this one-page, versatile theme that is powered by the Tesla framework and built on Bootstrap. The Sevenfold theme features three portfolio layouts, FontAwesome icons, is WMPL compatible, and includes a drag-and-drop form builder. 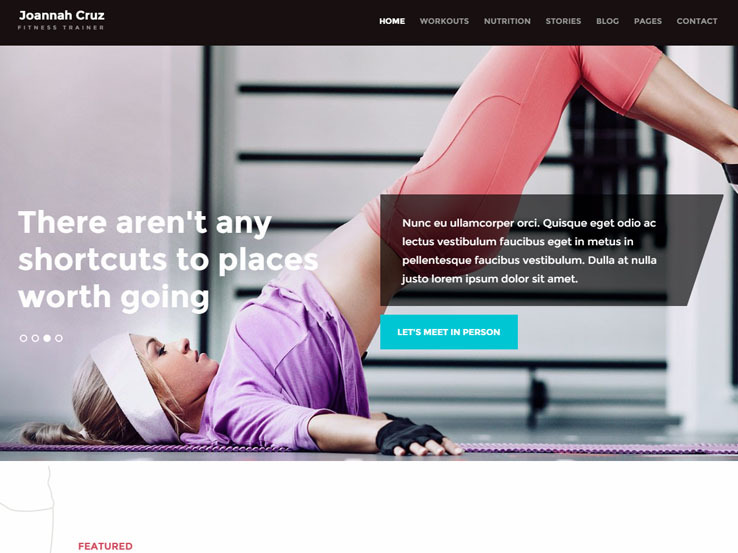 In Shape is a fitness-centric, responsive WordPress theme from Themefuse that is geared towards fitness professionals and gyms. It includes features such as a built-in workout module with a workout calendar and an exercise program. You can easily play videos, outline workout goals, and search exercises according to duration, body part, and difficulty. Plus, the theme comes with an endless number of fonts, color options, and layouts, and it also features a MegaMenu, which makes it easy to customize navigation content and add a variety of elements. 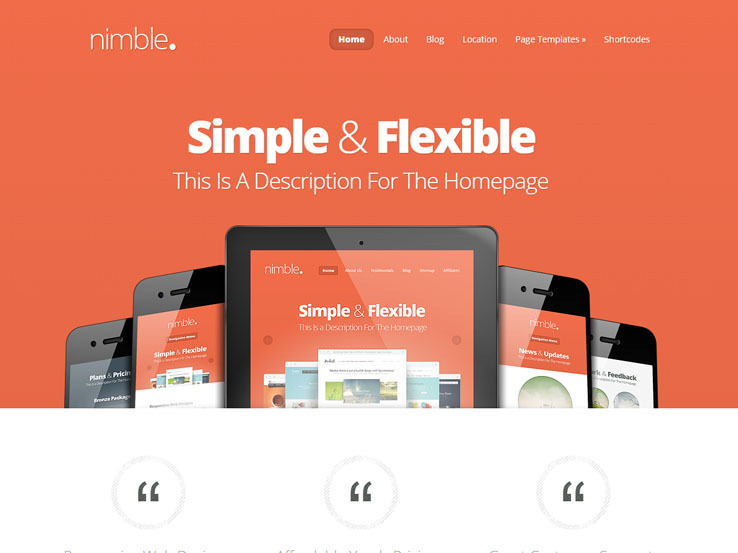 Nimble is another great responsive WordPress theme from Elegant Themes. If you are looking for a basic, high-impact business website, this may be the right template for you! The theme features five unique color schemes that you can select with a click of a button. It includes .mo/.po files for theme translation and has been tested across all major browsers. The code is W3C compliant, so you don’t have to worry about major security glitches. Plus, you can choose from a variety of page templates and use any number of Elegant Themes’ custom shortcodes to add some dynamic content to your site. Awaken from Zig Zag Press is a premium responsive WordPress theme built for the Genesis framework, which is one of the premier industry frameworks available today. Awaken features a large, full-screen slideshow. Attention to detail further sets apart this theme, with pricing tables, social media, a blog, and even a portfolio included in the design. The design is also impressive. From parallax effects creating extra dynamics to various post format designs on the blog, it is plain to see that there was a lot of thought and planning involved in every small step of creating this lovely theme. 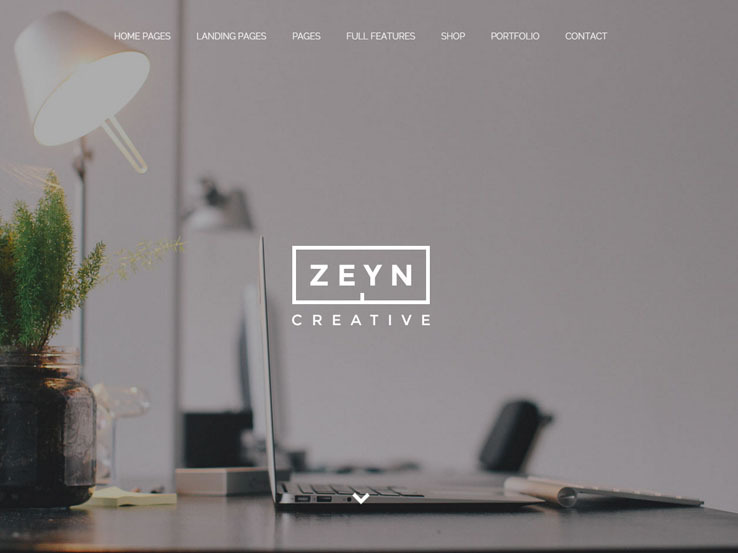 A beautiful theme, Zeyn is one of the top sellers on ThemeForest – and with good reason! 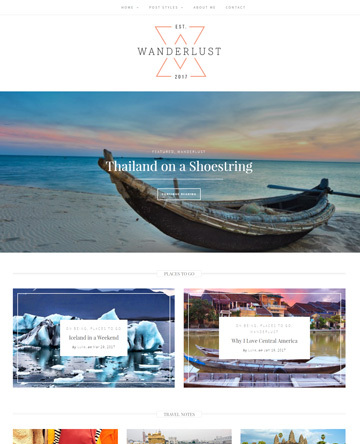 You can use this theme for any type of website, including restaurant, automotive, medical, corporate, creative, artist, blogger, real estate, travel service, web hosting, eCommerce, and wedding – there are site previews for all of these possibilities! Buy one theme and use it again and again! Customize virtually any aspect of the site, from headings to navigation layout and everything in between. Pool Cleaning WordPress theme is a perfect choice for maintenance service businesses online. The theme is fully responsive and looks great even on mobile devices. Cherry Framework 4 and MotoPress editor will make it easy to customize the theme even for the beginners. 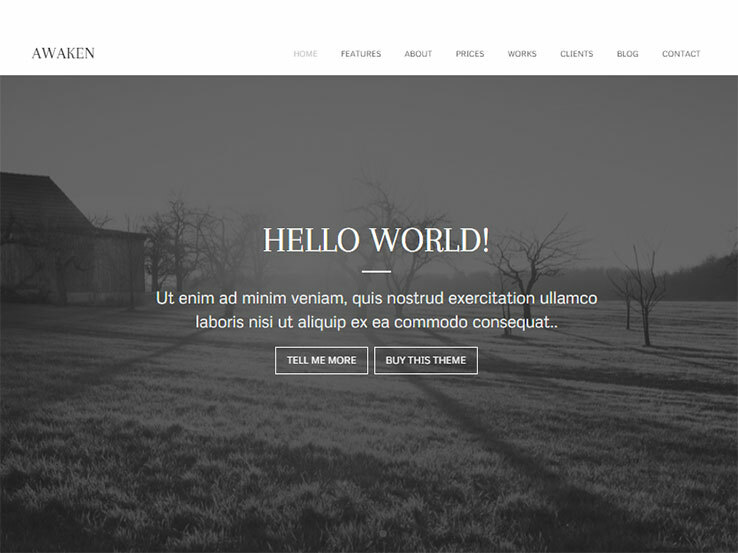 Thanks to the parallax effect, the template looks modern and trendy. Multiple page templates are included as well as social integration. Advanced theme options are great for additional customization. The color scheme is pleasant and visually appealing. If you come across any problems, a 24/7 free support team is always ready to help. 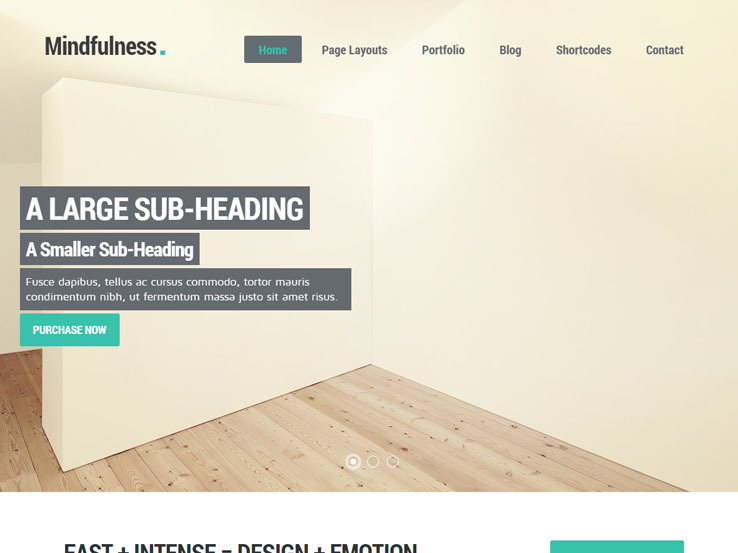 The Mindfulness Theme is a responsive theme that looks great across all screen sizes and devices. The theme also includes a clean and SEO-ready layout, with powerful code and localization for translating your website. Create a portfolio, include a blog, and even modify the stunning slider that comes along with the theme. The shortcodes are a nice touch, considering you can make anything from buttons to columns, sliders to team boxes, all without knowing how to code. The Bijou theme comes from ZigZagPress and it is primarily designed to help with making a responsive and powerful portfolio website. The multipurpose theme can practically be used for any type of website, with its simple, modern look and flat design elements. Obviously, the theme is completely responsive, working on every tablet and smartphone out there. The slider supports high-resolution photos and it can include text overlays and buttons that serve as great calls to action. Feel free to play around with the various page and post layouts, and choose between a three or four column portfolio. The shortcodes make it easy to add things like buttons and the portfolio has a filtering feature that turns it into a clean and professional looking interface. The Vanilla theme is also from ZigZagPress, a company that knows how to make mobile-ready themes without any compromise. This one is super clean and minimalist, with responsive design that ensures the theme will look even better on smaller phones and tablets. You have access to various social media buttons and they are all branded to fit in with the theme. Not to mention, the slider is almost the size of the screen and it includes overlaying text for call-to-actions. With shortcodes, you can build column layouts or lightboxes without knowing any code, and the portfolio options provide filters and galleries for the quintessential display layout. 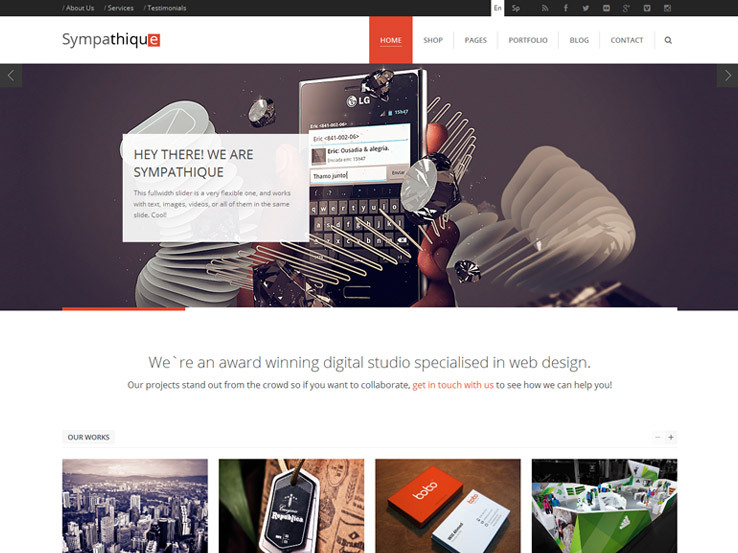 The Architecture Studio theme has everything you need for a professional online presence. Minimal design and a pleasant color scheme make this theme a perfect solution for architecture and real estate companies. But thanks to its easy customization, you can adjust it to almost any business purpose. A fully responsive layout is extremely important as more and more customers browse with mobile devices. Thanks to the admin panel, you will be able to customize almost every detail of the layout, including fonts, colors, structure, and backgrounds. Cherry Framework and Bootstrap make it easy to further customize the theme. 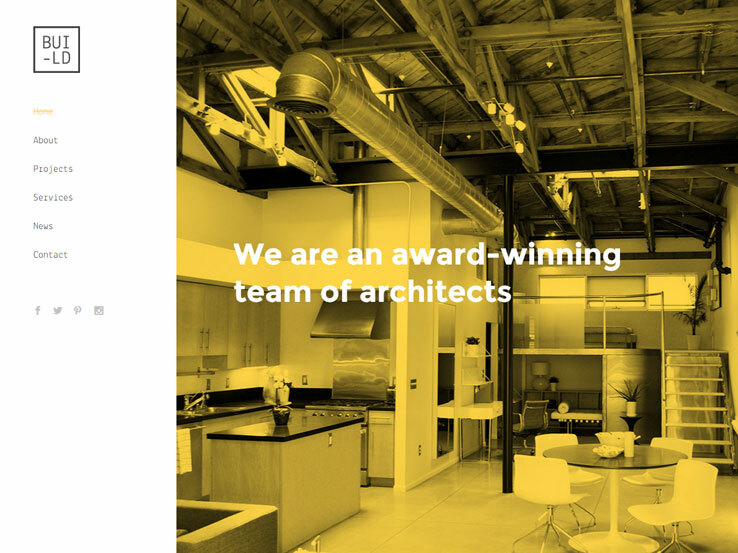 Architecture Studio is WPML-ready, SEO-friendly, and has parallax effect animation. On top of that, you also get 24/7 free support and all the images included for free. 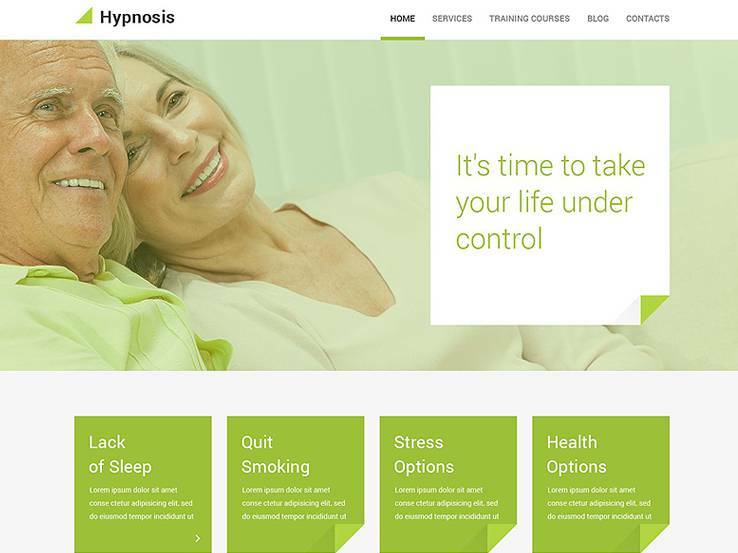 This theme is a perfect choice for hypnotherapy clinic website. The green color scheme and smooth layout create a sensation of confidence and trust. The theme can be easily customized for any other kind of health care or medical institution and is built on Cherry Framework 4. MotoPress Editor and MotoPress slider are included, which means that even without any specific coding skills, you can adjust any element of the layout and redesign it to best suit your needs. The theme is responsive and adaptable to any screen. The installation and customization take only a few minutes. Blog and portfolio pages make it easy to showcase your work and boost your search engine rankings. On top of that, you get all the images included with the template for free. 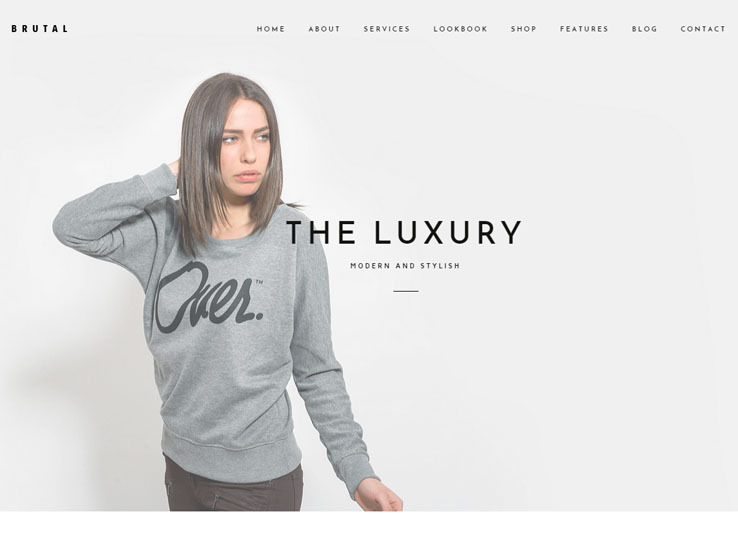 Great use of parallax makes the theme trendy and creates a lasting impression on your visitors. Travelling makes most of us happy so why shouldn’t your happiness start from the moment you start to plan your trip? That’s why an online tourist agency website should create trust but at the same time present all the information in an organized fashion. This theme can be the right choice because of its simple yet stylish layout that features an impressive background image. The theme is responsive, Bootstrap-based, and powered by Cherry Framework, which means it is easy to work with. Blog and Portfolio sections are included so you can showcase various destinations and share travel tips with potential clients. Thanks to the lazy load effect, the website is loaded in few seconds. Parallax adds a stylish and trendy flair to the whole theme. The template is WPML-ready so you can attract customers from all over the world. 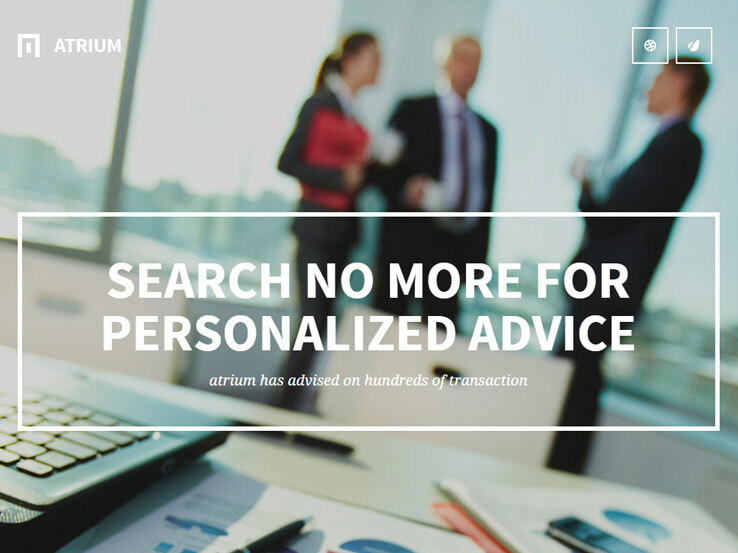 The Atrium theme is a gorgeous one-page theme that looks great on any device. It includes a stunning parallax effect, which is perfect for grabbing the attention of your users. The responsive corporate theme has everything you need to create a professional and stylish online presence and it includes a demo content installer, which is wonderful for those who don’t want to start from scratch. The drag-and-drop page editor is a nice touch, and more than 30 content elements ensure you never run out of customization options. Not to mention you can generate your own shortcodes for adding items like buttons, accordions, and more. Your wedding day is supposed to be the most wonderful day in your whole life. Everything should be planned in advance. Thus, the web site for wedding industry should look elegant and trustworthy. This WordPress template is a perfect match for a wedding company. The layout is simple, yet stylish and exquisite, which provides the sensation of confidence. The theme is fully responsive and easy to navigate. The lazy load effect significantly decreases page load time, and parallax effects ensure that your website keeps up with the modern web design trends. Based on Bootstrap and Cherry Framework, the theme is extremely user-friendly both for the web master and for the end user. You can also easily change almost every element of the layout to make it look according to your vision. 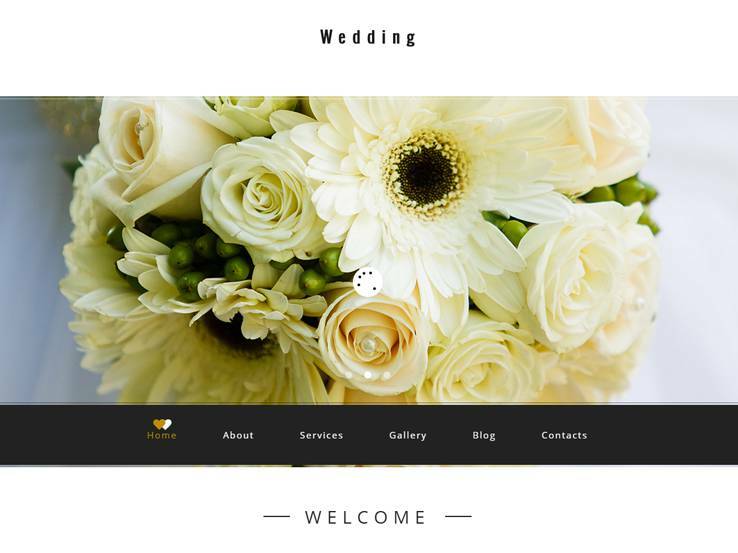 Upon buying this Wedding WordPress theme, you also get all the images that are included in the theme for free. 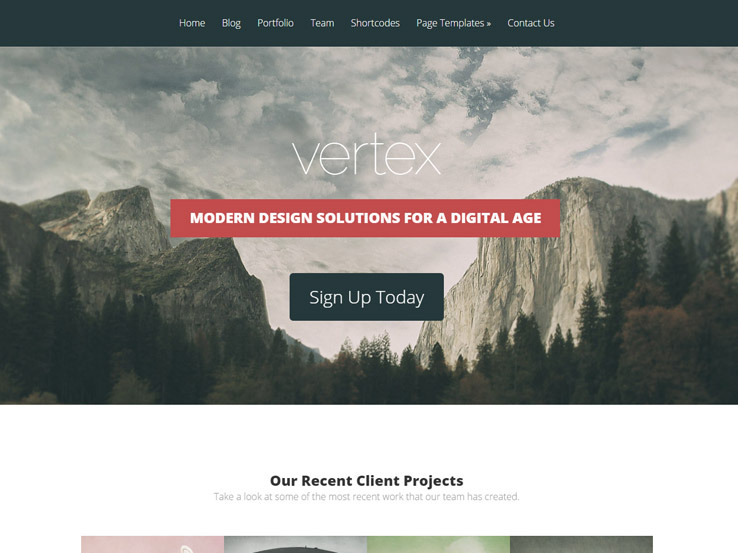 The Vertex theme is a product from Elegant Themes, and they are known to make options that fit well into the responsive category. This one is designed for companies who sell services, and every module, from the sliders to the images, adapts perfectly to various screen sizes. The goal with this theme is to show what services you offer in an engaging manner. It allows for media galleries, sliders, testimonials, and team member bios, all of which take just a few minutes to setup. The theme supports complete localization for translating your website to reach out to people all over the world. You also have access to unlimited colors, making the branding process quite simple. 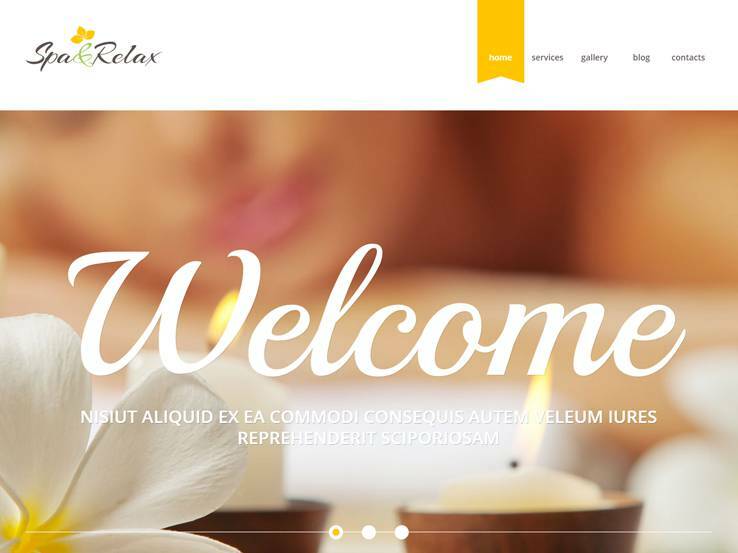 This relaxing WordPress theme is a perfect solution for the spa and relaxation industries. It offers a stylishly simple layout with clean, white color scheme. The template is fully responsive which means it will look perfect no matter what mobile device your customer is using. Being WPML-ready, the theme will get you clients not only from your own country, but from abroad as well. With Bootstrap and Cherry Framework you will discover how easy it is to install and customize the theme. It is simple both for the front-end developer and for the end-user. With the theme you also get all the images for free. Should you encounter any issues while setting up your website, you can count on a 24/7 support team to help you solve them. Philanthropy Nonprofit WordPress Theme is a responsive theme made with non-profit organizations in mind. It has lots of features to make your site look great. It has several page templates including About, Projects, Donate, and Contact. It includes three different sliders. The first slider animates the text. The second and third sliders have more style and can display video. There’s a built-in events calendar to keep visitors up to date on all of your upcoming events. You can even set events to recur daily, weekly, monthly, or yearly. It has a responsive mega menu that’s customizable and user-friendly. You can easily change how it looks and feels, and you can change the highlight colors from the admin area using a color picker. This gives you unlimited color options. It has Google Fonts integration so you can change the font and not worry about the speed of your site because they’re stored on Google’s servers. It’s responsive and Retina-ready so it will look amazing on any screen or device. This theme is a great choice for anyone who wants to stand out from the crowd with a unique look and feature their content. 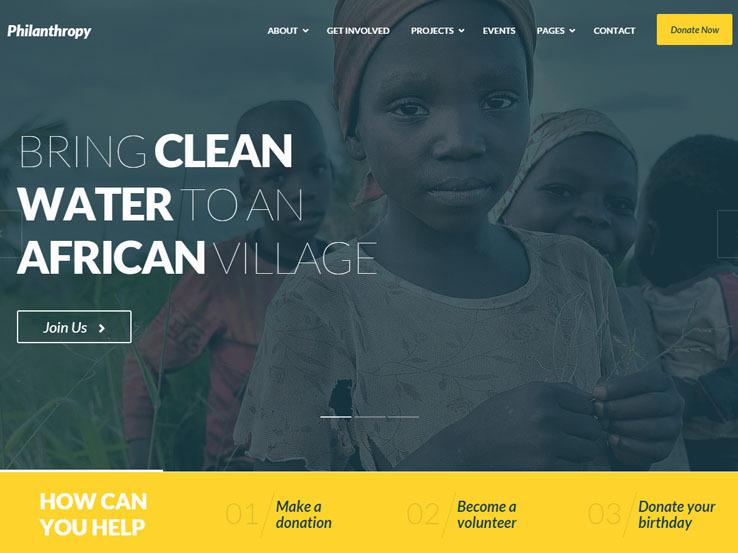 With its non-profit focus, every non-profit organization will get their message across with this responsive theme. The Start WordPress theme may be considered one of the more professional one-page layouts on the market. The clean lines and white space combine together the create a beautiful presence for clients and customers. The theme is fully responsive, which ensures your website looks great on all devices. The Start theme was built on Bootstrap, and it provides a stunning parallax effect that works nicely with the one-page setup. Basically, anyone can scroll down the homepage to locate the majority of the content on your website. As they scroll down, each of the parallax backgrounds add a solid effect for showing off your creativity and grabbing the attention of your visitors. The localization allows you to connect with people from all over the world, and the header module shows people what they can expect from your company. The header/slider also has a solid overlaying element with buttons and text. Therefore, it works great as an area to place your calls to action that direct people to your sales pages. The blog is helpful for boosting your search engine rankings while the contact form is easy to manipulate. 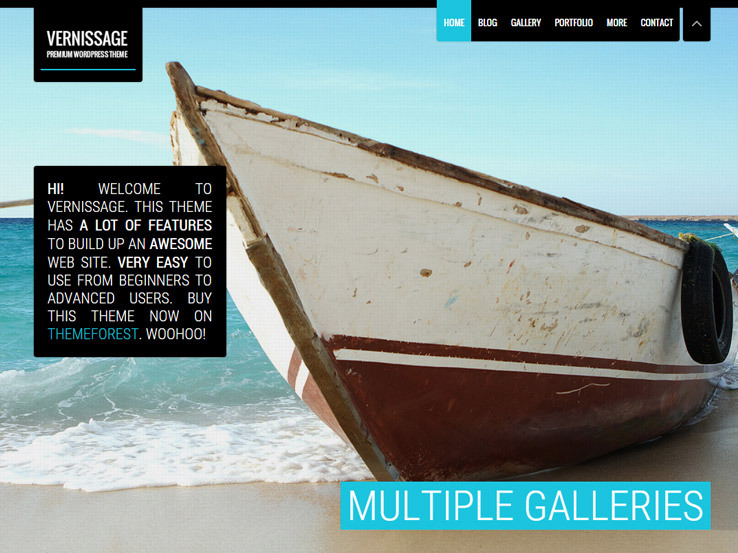 A gallery and a decent amount of page templates are included with the theme. All of your features are organized into columns with icons. Most would argue that this is the quintessential one-page, responsive theme, so give it a try and let us know what you think. 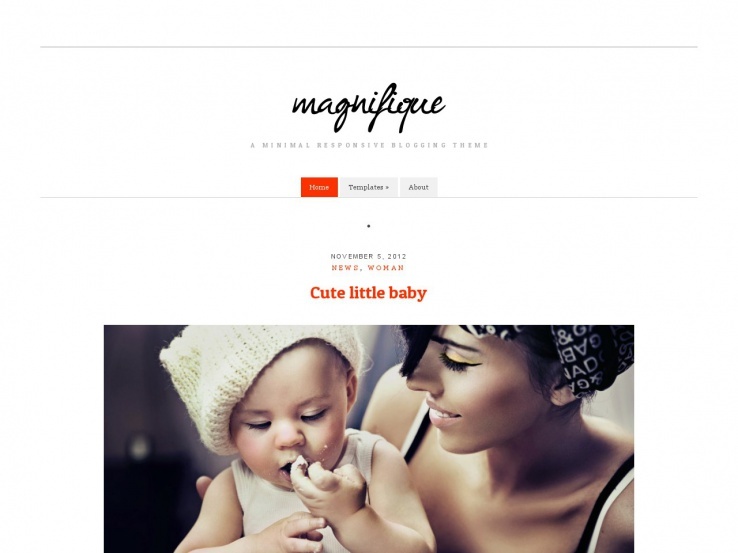 The Magnifique WordPress theme has some interesting features, and as you might assume, the entire theme is responsive. This means that anyone can bring up the site on a smaller device and still look through your posts and see images. The minimal design is ideal for this type of setup, especially since so many people are using their mobile phones to look at articles. The theme is perfect for anyone looking for a simple and elegant theme that allows them to put the focus on their content. For example, you don’t have to manage any sidebars or widgets or any complicated settings. It’s all about getting your hands typing and publishing your blog posts. You can easily add your own logo and the theme includes multiple color variations for your branding pleasure. The SEO optimization for the Magnifique theme is solid, which is ideal for boosting your search engine rankings. One thing we particularly enjoy about the theme is that it includes a few shortcodes that allow you to create items like buttons, columns, and more without the need to touch a single line of code. The theme also includes quite a few page templates which are helpful for adding variety to your site. Overall, this is one of the simplest options we’ve seen. With responsiveness and clean blog post formats, you can’t go wrong with the Magnifique theme . Impreza is a great theme to start off the list considering it’s fully responsive and looks great no matter which device your visitors are using. The theme includes several different demos to choose from which are suited for a variety of niches. You can easily create a restaurant website as well as an online store. 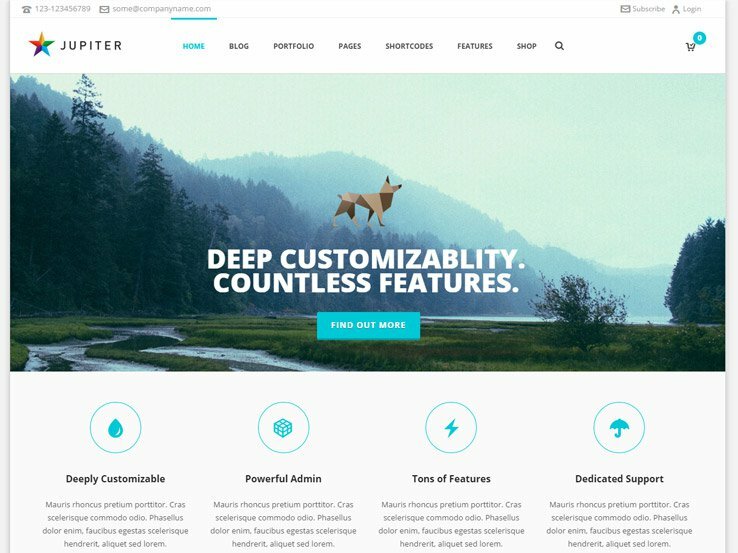 The notable feature of this theme is the unique header builder which allows you to create any type of header you want. This makes for some interesting branding possibilities while still making your navigation easily accessible even on mobile phones. Parallax effects are also included which pair well with the responsiveness of the theme and don’t slow down your website. On top of that, Impreza comes with 3 premium plugins included for free, all of which allow you to create a mobile responsive website. The Visual Composer plugin makes it easy to create any type of layout thanks to its drag-and-drop interface and it will look wonderful on smaller screen sizes. The Revolution Slider makes it easy to create stunning sliders to feature your best posts, services or products and your visitors will still be able to see them correctly resized on their smartphone. Along with shortcodes, one-click demo import, translation files, SEO optimization, and more, the Impreza theme packs quite a punch. AccessPress Pro is a fully responsive multipurpose theme suitable for businesses, minimalist websites, creative sites, blogs, and just about any kind of modern website. The clean and elegant theme comes with many fantastic features and is highly customizable so you can easily match it with the rest of your brand. An attractive full-width slider lets you feature your best content, offers, and promotions on the homepage. The theme provides several homepage layouts; so you can always choose a design that fits with your style. You’ll also find an events module to promote your upcoming events, a portfolio to showcase your work, and eCommerce integration for those looking to sell their products online. You can easily configure social links/icons on the header/footer, and there’re multiple shortcodes to easily add elements like testimonials, team members, toggles, call to actions, and more. 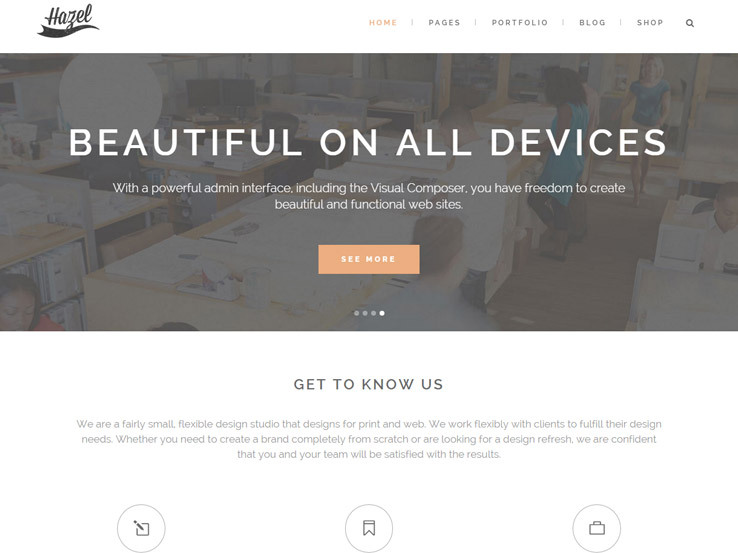 The Hazel theme gives you the freedom to create any kind of website you can imagine. The clean, creative, and fully responsive template looks sharp on any device and screen size – from smartphones and tablets to laptops and large desktop screens. Choose from tens of pre-built demo designs depending on what kind of site you’re creating; be it a portfolio, online shop, a one-page, or an agency website. Multiple header and title are layouts, customizable menu, unlimited page layouts, and a user-friendly page builder along with many other flexible theme options make it easy for anyone to create a unique websiote using this template. Besides, the Hazel theme supports video backgrounds and it’s translation ready, making it easy to display your website in different languages. The Sympathique theme has a responsive design that fits perfectly on mobile devices and large desktop screens as well. 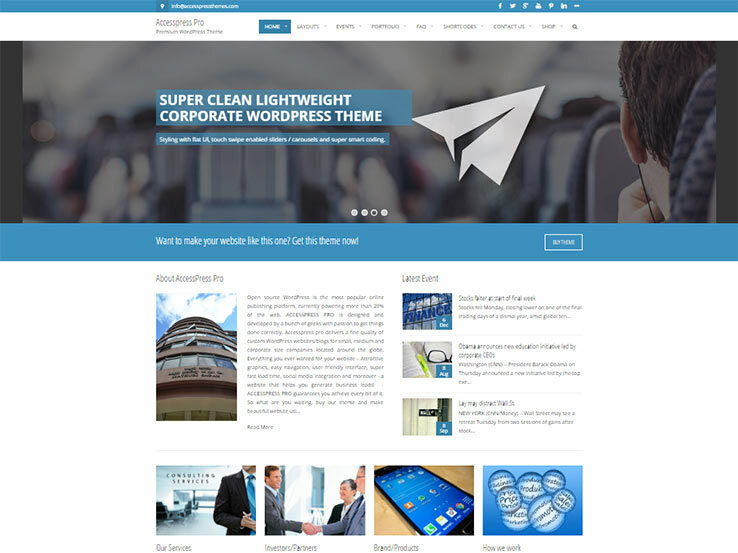 The clean and modern theme can be used for different kinds of business sites – from agency and corporate sites to freelancer portfolios. It provides a number of homepage layouts to choose from, and it also includes a drag-and-drop page builder to easily create your own custom layouts. A stylish full-width slider is included with the Sympathique theme, and its perfect for highlighting your best content or offers on the main page. Present your previous works using a versatile portfolio, add testimonials, galleries, pricing options, and more. Additionally, this template is translation ready, which will help you localize your website for the language your audience prefers. 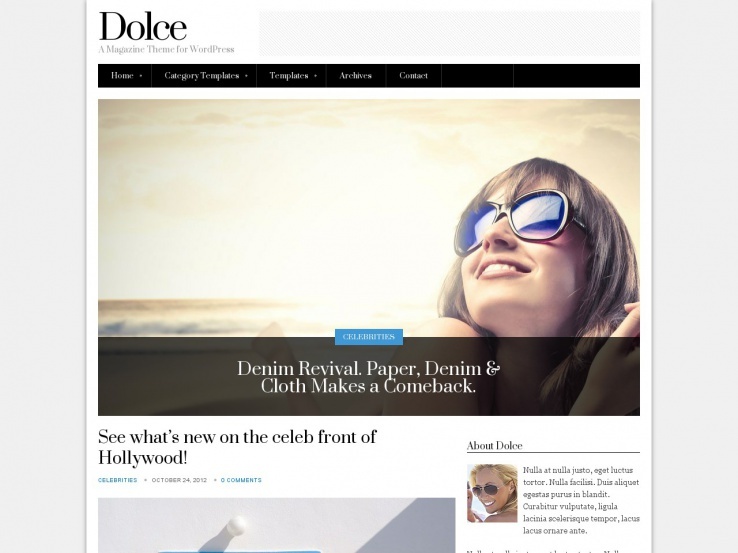 Dolce is a sleek and responsive WordPress magazine theme by CSSIgniter. It features a beautiful front-page slider, which is perfect for promoting your best content and driving visitors further into your site. 5 homepage layouts are included with the template, giving you the option to select a style that fits your needs. You’ll also find many pre-built category and page templates, which will help expedite the design process for you. We also enjoy the stylish sidebar, which provides space to display things like advertisements, about us information, recent posts, social media links, and much more. Besides, the Dolce theme supports post formats, allowing you to add a variety of content to your magazine, including video posts, audio and images. 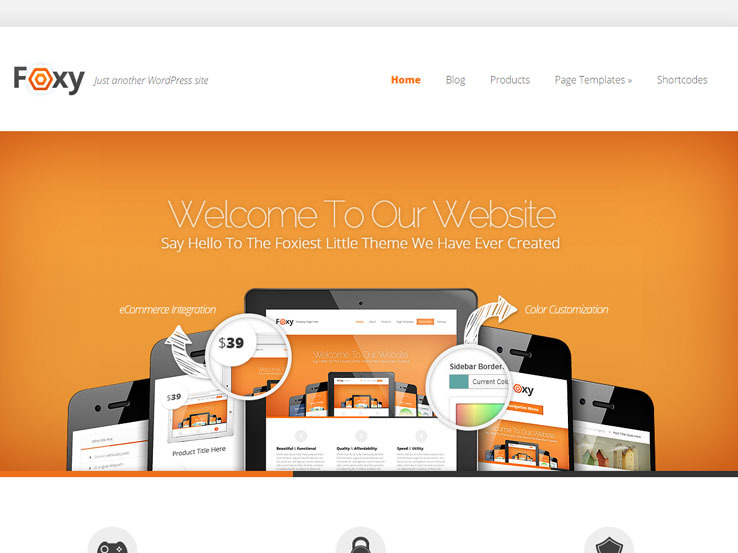 One of the best responsive WordPress themes around, the Foxy theme from Elegant Themes is worth checking out. It features a large banner slider, featured pages, five unique color schemes, shortcodes, and more. You can easily control the look and feel of your site even without touching code thanks to a powerful user-friendly theme options panel. Perfect for businesses, the template integrates nicely with the WooCommerce plugin, allowing you to sell your products online within minutes. It includes product detail pages as well as carousels to feature your best products. In addition, you’ll find many page templates for sections such as contact us, portfolio, galleries, sitemaps, and more. Novo is a stylish Genesis child theme designed by the folks at ZigZagPress. The mobile ready template can be used for blogs and business sites alike. It includes a number of homepage designs, and you can easily create your own custom layouts. You’ll also find several page templates for different purposes, including landing pages, portfolio, and gallery. A blog page is included with the Novo theme as well, providing an opportunity to share valuable content and generate more traffic from social media and search engines. A beautiful slider allows you to highlight your best content on the homepage, while the static navigation menu makes it easy for users to find the content they want. Also, lots of shortcodes come with the theme, and you can use them to easily add elements like buttons, call to actions, columns, notification boxes, tabs, and much more. 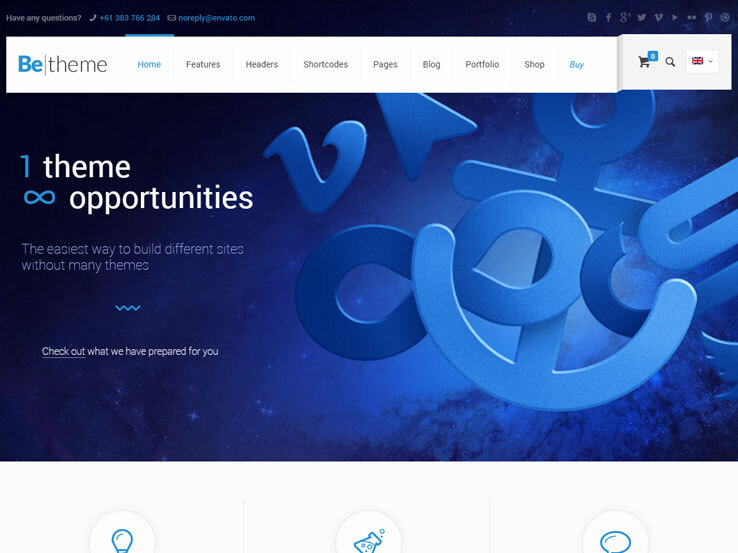 BeTheme is one of the most powerful multi-purpose WordPress themes in the market. The theme comes with hundreds of pre-built website designs, all of which are mobile responsive to ensure your site looks perfect on all devices and screen sizes. All these demos can be installed in one click, and a drag-and-drop page builder is included to help you create your own customer layouts easily and quickly. 11 customizable header styles allow you to create a completely unique website. Upload your logo, set colors, fonts, sizes and more to achieve the look you want. Along with a powerful admin panel, parallax effects and video backgrounds, translation tools, and lifetime updates, the BeTheme is a solid WordPress theme to launch your next project with. 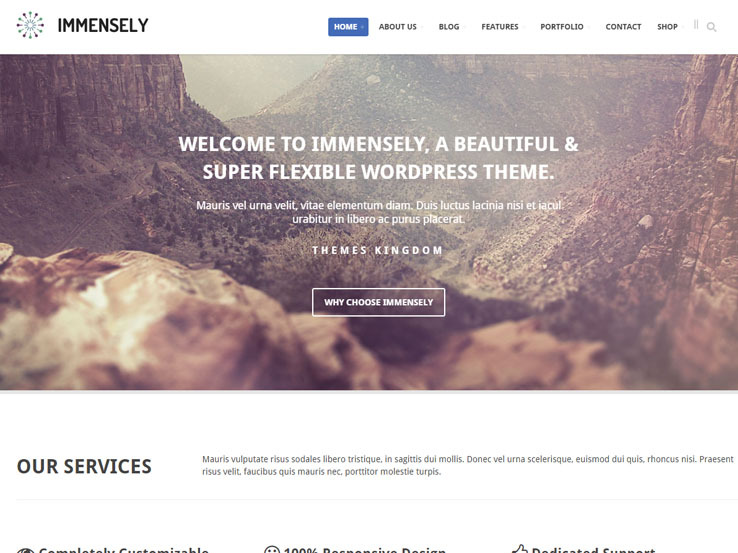 From Themefuse comes Freelancer, a responsive one-page WordPresss theme built on the Bootstrap framework. The template is perfect for freelancers and independent contractors of different kinds, including web designers, writers, marketers, and more. The theme admin is powered by the Fuse framework, which contains lots of features and settings to control the appearance and functioning of the theme. You can easily change the look and feel of your homepage, blog page, posts, backgrounds, footer and more. Besides, the Freelancer theme has well organized sections to present important information like your resume, testimonials, recent work, profile and contact details. 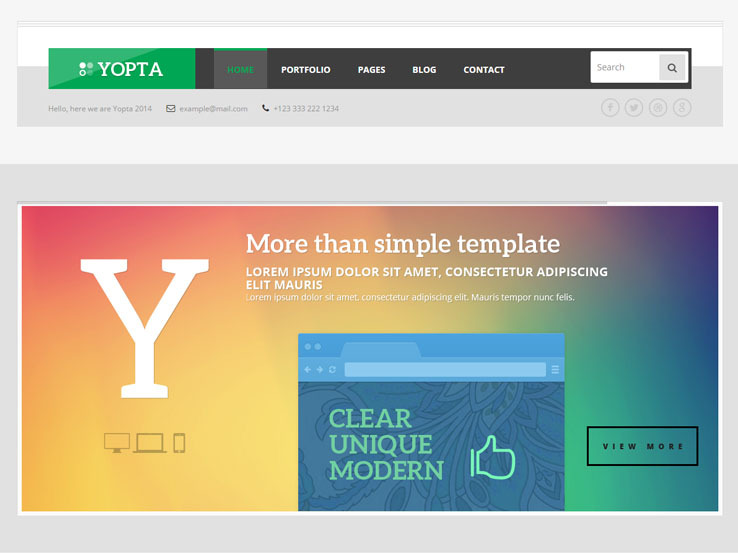 The Yopta theme has a creative, responsive design that looks great on a wide range of devices and screen resolutions. Best for business sites and blogs alike, the template brings lots of amazing features, including a portfolio with 5 different styles, an elegant slider to highlight your best content on the main page, Google maps, social media integration, and contact forms for people to easily get in touch with you. The theme is powered by the Tesla framework, which offers a dedicated area in the back-end with all the features and settings to control the look and functionality of your site. Moreover, the Yopta theme includes a drag-and-drop page builder to help you create your own custom layouts, supports video content, and is translation ready so you can easily display your website in the language you prefer. 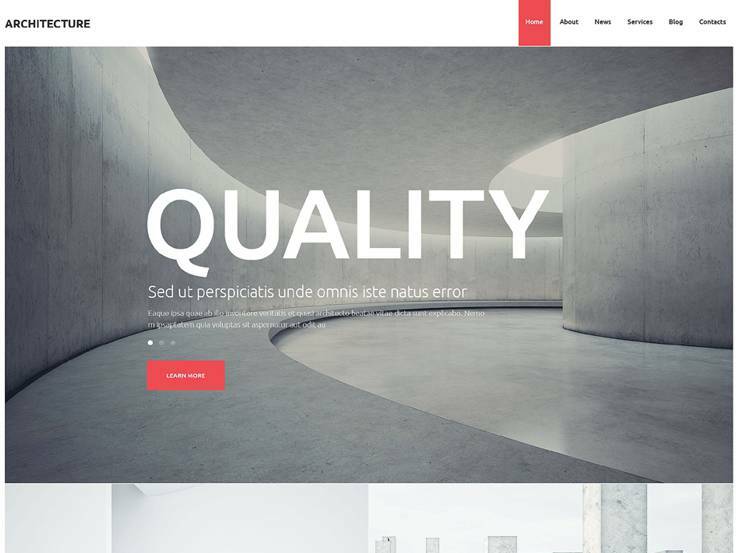 Meet Zero, a clean and modern WordPress multipurpose theme. Based on the much-loved Twitter Bootstrap framework, the template is lightweight, and it looks sharp on any device type. You can use it for your business site, blog, and even eCommerce site. It comes with many great features, including several homepage designs, WooCommerce integration, a drag-and-drop page builder, and a beautiful slider to feature your best content or promotions. The back-end has many great features and options to easily customize the look and feel of your site. You’ll find custom widgets, hundreds of fonts, icons, custom posts, and many different elements to help you achieve a unique site. 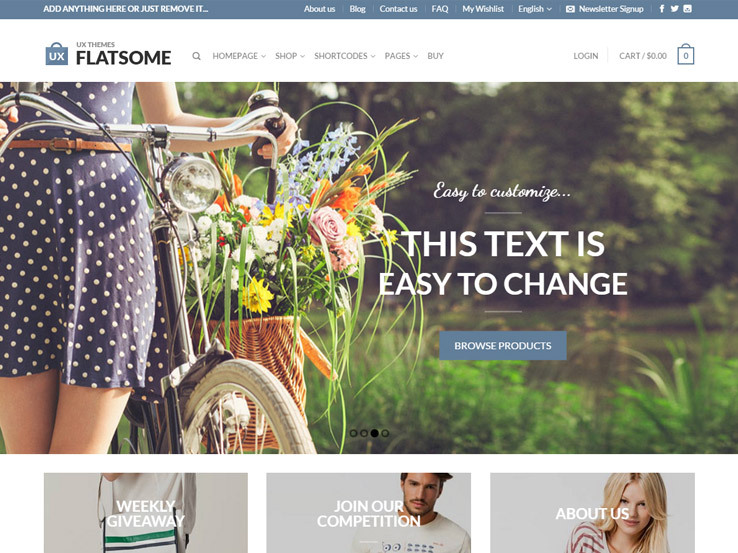 Flatsome is a super-fast responsive WordPress theme designed for eCommerce and business websites. It has a wide range of pre-built demos that can be quickly imported in just a few clicks. You’ll also find an intuitive drag-and-drop page builder with lots of amazing elements to help you create your own unique layouts even if you have no coding experience. You can customize everything from the back-end thanks to the user-friendly live theme options panel that provides live previews of the changes you make. Additionally, the Flatsome theme is WPML ready, meaning you can easily achieve a multi-language website with it. You’ll also get access to lots of video tutorials to guide you in using the template, and regular updates to ensure your website remains secure and performs efficiently. 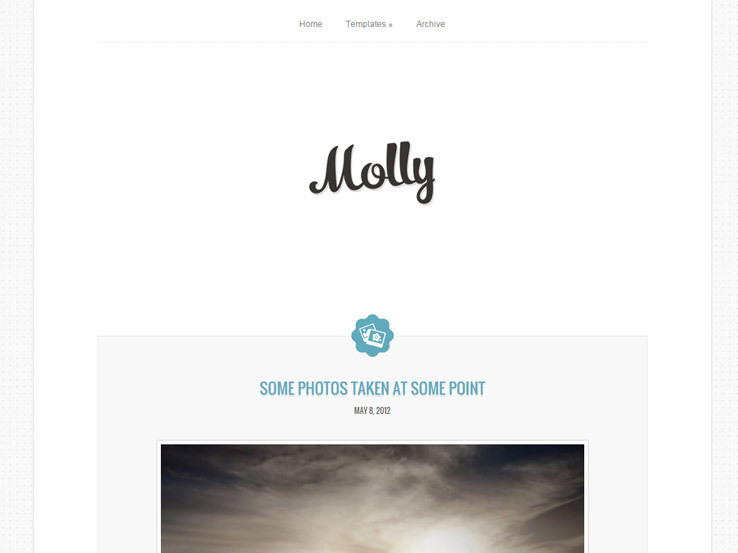 From CSSIgniter comes Molly, a clean, minimalist, and fully responsive WordPress theme for bloggers. It supports different post formats, allowing you to share a wide variety of content; be it videos, audio, link posts or image galleries. A custom audio player allows you to present your tunes or podcasts, and you can also embed videos from platforms like YouTube and Vimeo. 3 powerful drag-and-drop page builders are included with the Molly theme to help you create your own custom page layouts quickly and easily. You can use the Divi builder, Elementor or the SiteOrigin page builder depending on which one you find comfortable working with. In addition, the template is translation ready, and is optimized to rank high in search engines. 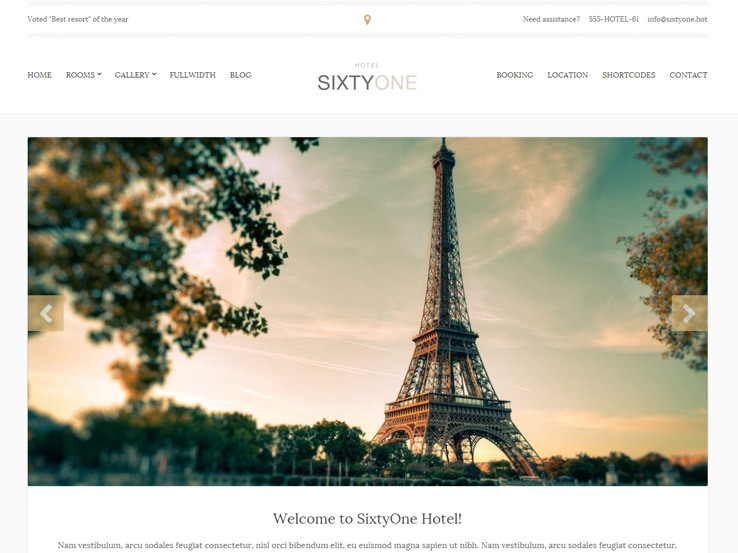 SixtyOne is a stylish, beautiful, and mobile responsive WordPress theme for hotels and resorts. It comes with an integrated booking system for taking online reservations, custom room pages, galleries and sliders to highlight your offers and promotions on the main page. Drag-and-drop page builders are included with the theme to help you create your own custom layouts. You’ll also find Google maps to help potential customers find your location easily, and a powerful theme options panel to control the template’s appearance and functionality. 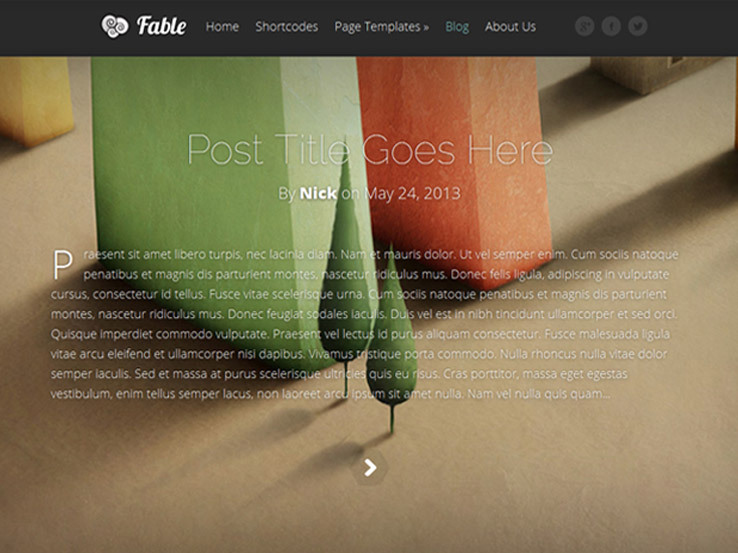 Fable is a beautiful blogging theme with bold elements that will make browsing your site enjoyable. The template is mobile and tablet friendly, so your website will display beautifully and seamlessly on all devices. It’s also localized for easier translation, and it supports different post types including video. Several page templates come with the Fable theme, making it easier to create sections like contact pages, portfolios, image galleries, login pages and more. Besides, there’s a powerful theme options panel that allows you to easily control your website without messing with code. Bodega is an elegant feature-rich multi-purpose WordPress theme that can be used on various types of business sites. The theme comes with over 30 pre-built website designs targeting different types of businesses. All these designs are responsive and fully customizable; so you can style them to fit your specific needs. Better still, a drag-and-drop page builder is included to help you create your own custom layouts easily without touching lines of code. 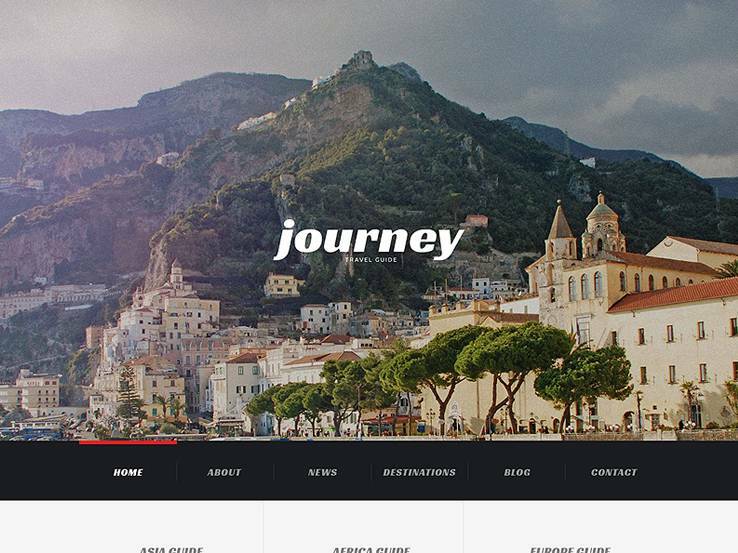 Stylish sliders and carousels with stunning animations add to this template’s beauty. You’ll also find 6 header styles, a bunch of fonts, 4 icon sets, and many more design elements to help you establish a truly unique website for your business. Moreover, the Bodega theme offers multi-language support, and comes along with detailed documentation to guide you when setting up your site. 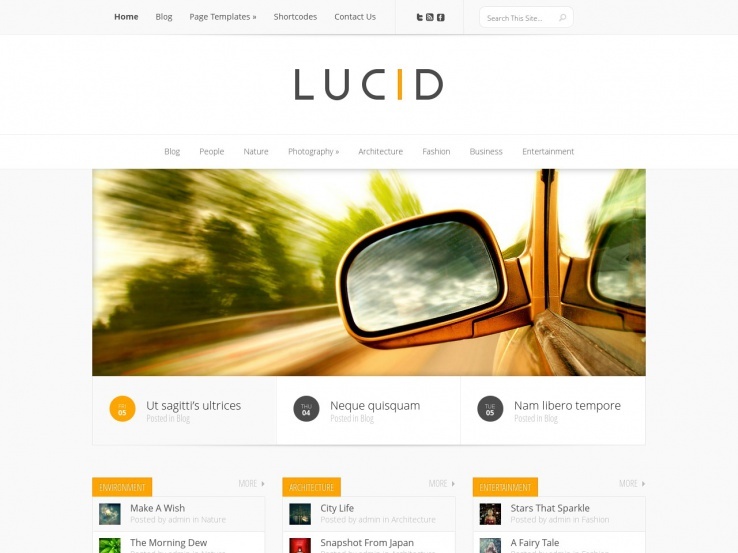 The Lucid theme comes from Elegant Themes, and it’s fully responsive, adapting to all screen sizes for a smooth browsing experience. The stylish theme is a superb choice for magazine websites. The front page is well organized to accommodate lots of content without looking clunky. There’s a large logo space at the top, a beautiful slider, and a collection of your articles below. Support for video and audio posts allows you to add variety to your content; you can even embed videos from platforms like Vimeo and YouTube. You’ll also find several page templates, social media icons and a feature-rich theme options panel to control your website. 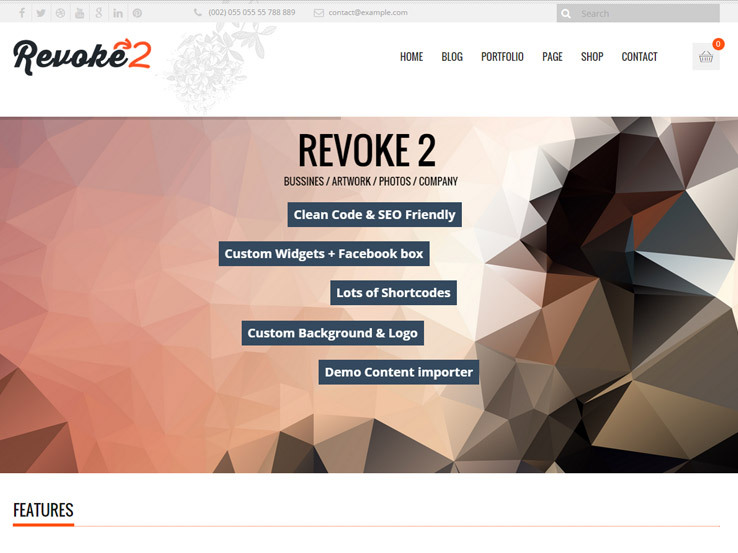 Consider the Revoke2 theme if you’re looking for a slick, fully responsive design for your website. Your website will look modern and clean on all screen sizes and across all modern internet browsers. Lots of great features and options are included with this template, making it easy for you to establish a business site, blog, online store and many other types of websites. Highlight your offers, promotions, or other important information on the main page using a beatiful slider that goes unnoticed. 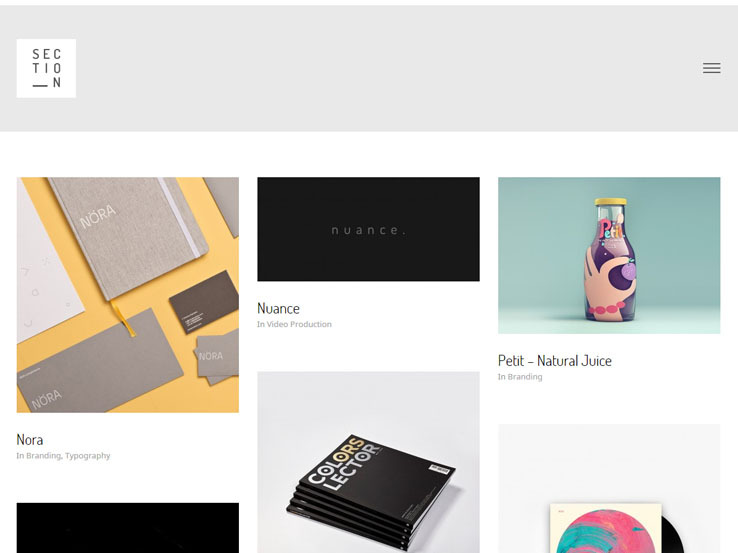 Portfolios are included to help you showcase your past work, while support for the WooCommerce plugin means you can start selling your products online within minutes. You’ll also find social media integration and lots of options to customize the theme according to your requirements. 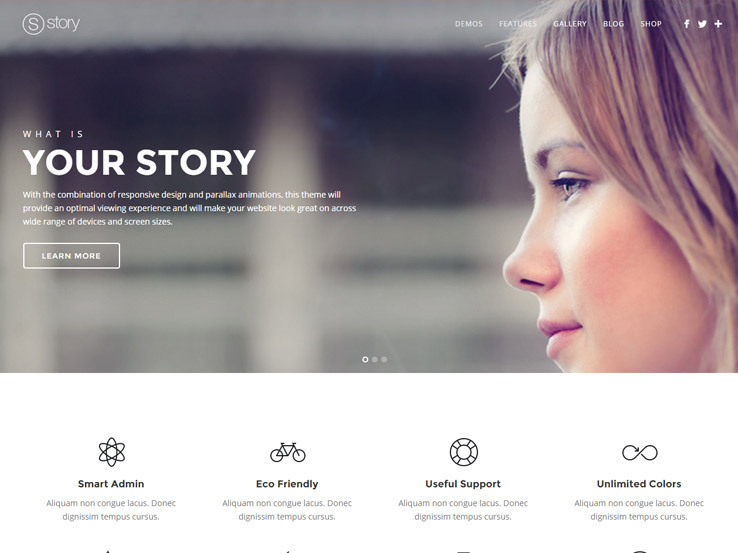 Electra is a clean and modern WordPress multi-purpose theme that can be used on a wide variety of websites, including portfolios, business, blogs, and more. It has a fully responsive design that provides for smooth a browsing experience on any kind of device – it doesn’t matter whether your visitors are on smartphones, tablets, e-Readers or large desktops. The template packs lots of beautiful features under the hood. You’ll find several homepage layouts as well as pre-made templates for creating different pages. Integration with the Slider Revolution plugin allows you to highlight your best content on the homepage. Moreover, the portfolio is really impressive, providing several styles for presenting your previous works. 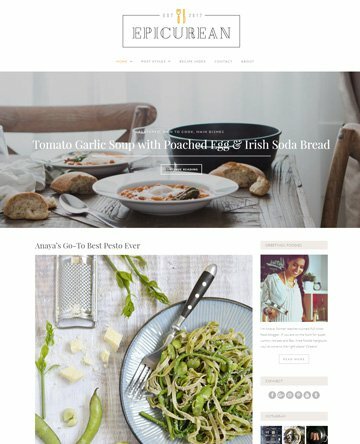 The Cuisiner theme was designed for food-related websites, and it features a responsive design that looks great on a wide range of devices. The colorful theme brings a tasteful feel and includes lots of large image areas to show off photos of your delicious dishes. You’ll also find a large, attractive front-page slider and carousels to highlight your best cuisines. A powerful control panel on the back-end makes it super easy to customize the theme according to your style. 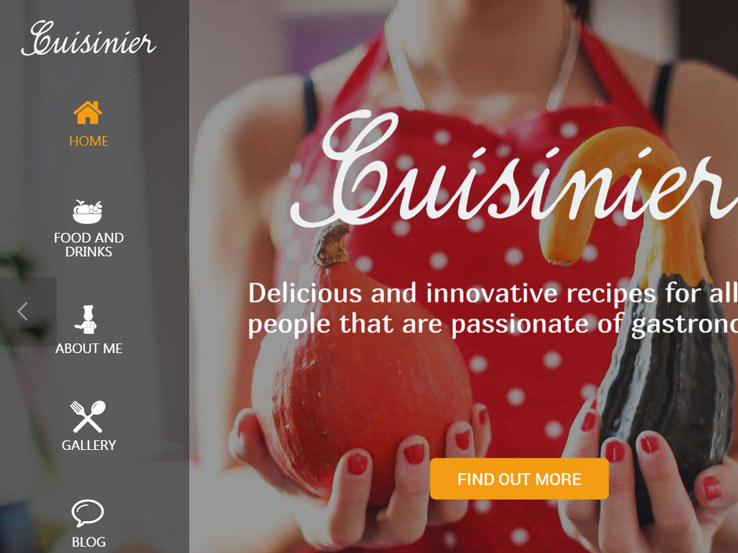 Besides, the Cuisiner theme includes several custom posts for different purposes, including recipes, portfolio items, testimonials, team members, and events. Your fans will be able to follow you and share your content on different social platforms thanks to the social media integration, and there’s also a contact form for people to easily get in touch with you. 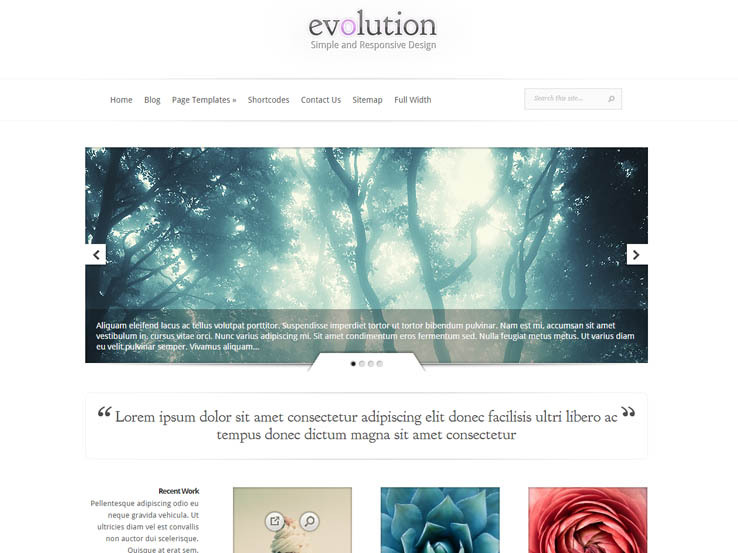 The Evolution theme is perfect for browsing on mobile devices. It looks clean and modern on all screen sizes, so it doesn’t matter on which devices your visitors come from. Lots of negative space help bring your content into focus and visitors will have no problem viewing your texts and images. 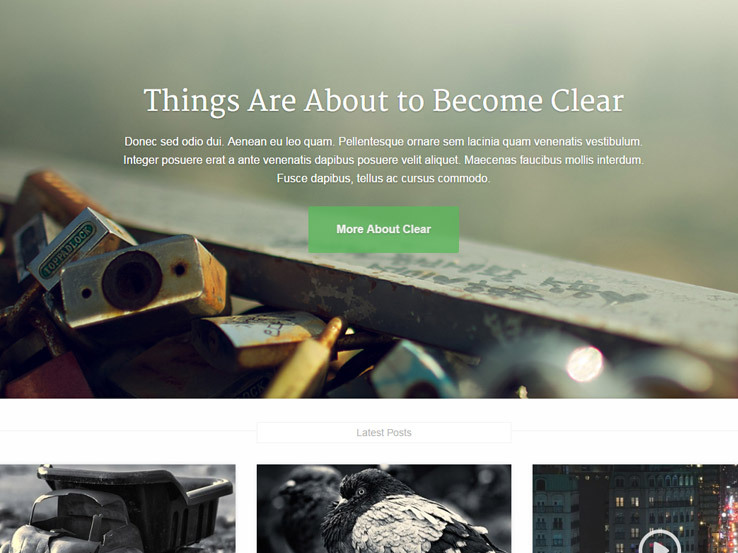 You can use this theme to create a blog or a business website as well. It comes with useful business-related features such as a portfolio with different versions, a gallery, and sliders to highlight your important information. The theme provides 4 unique color schemes, allowing you to choose a style that matches with the rest of your brand. Besides, translation files are included if you’d like to display your website in your local language, and there’re lots of customization options to make the template your own. 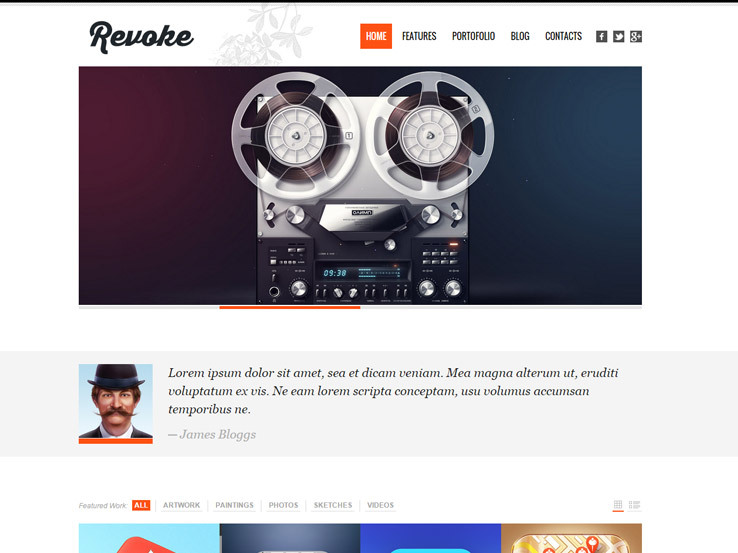 Consider the Revoke theme if you’re looking for a stylish, responsive template to create your portfolio with. The clean and modern theme looks great on all devices and platforms. 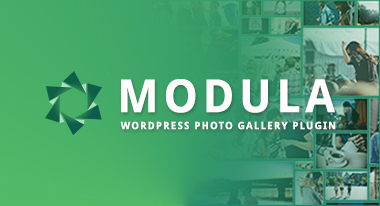 Although you can can customize it to match any website type, we really enjoy the theme’s portfolio module, which allows you to display your items in list and grid style and makes it easy for users to filter the portfolio items. Many customization options are included on the back-end, allowing you to style the theme without ever touching a single line of code. A stylish slider welcomes visitors on the homepage, and you can also display client testimonials and logos to boost your credibility. Additionally, the Revoke theme is social media friendly, and it supports google maps. The Skywalker theme is an excellent pick for businesses and bloggers looking for a mobile-friendly, clean and modern website. The template looks great on all types of devices, and contains many impressive features. The main slider on the front-page has thumbnails and offers a great opportunity to highlight your best content and offers. Another impressive feature of the Skywalker theme is the portfolio, which allows you to present your past works. The portfolio is filterable and you can choose from several layout options. Better still, you can further highlight you previous work using the stylish carousels. You’ll also find a dedicated blog section and social media integration options that make it easy for your fans to follow you and share your content on different platforms. 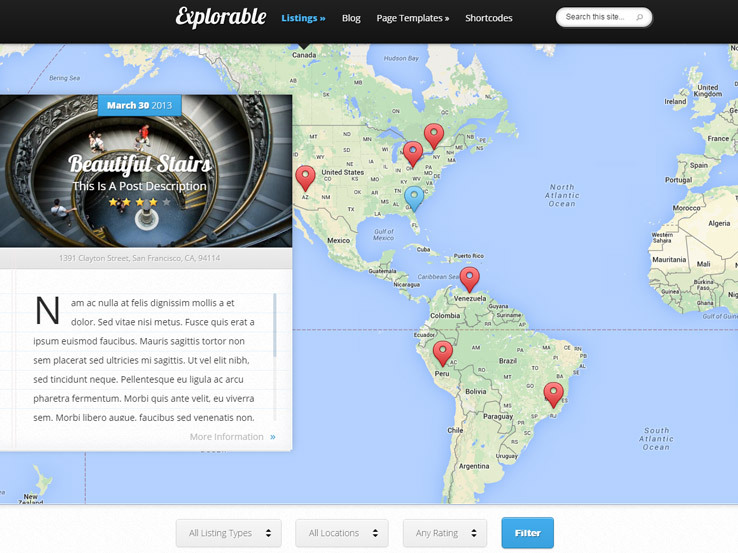 The Explorable theme comes from Elegant Themes, and it has a beautiful responsive design that adapts seamlessly to all device types and screen sizes. The template is perfect for creating location-based websites such as local business directories, city guides, and travel blogs. It features a large map on the main page and allows you to create location-based listings, which can be filtered based on listing type, location and user ratings. User ratings add social proof to your website, while the dedicated blog provides an opportunity to share valuable content and attract more traffic to your website. Furthermore, the Explorable theme includes localization files, which make it easy to translate the theme into your local language. The Quince WordPress theme is a great pick for businesses looking for a modern, responsive and Retina-Ready website. The template provides several home layouts to choose from, and they all look great on mobile devices as well as on high resolution displays. Under the hood, the Quince theme has lots of useful features, including a user-friendly page builder that makes creating custom layouts enjoyable, custom page templates, and beautiful sliders for highlighting your promotions, offers and other valuable contents. The portfolio module is impressive as well, providing different designs to present your work. The Invention theme comes with several mobile responsive demo designs along with a powerful feature set and lots of customization options. With this theme, you can easily and quickly create a clean, modern and professional-looking website for different purposes. The theme options panel contains many useful customization options and makes it possible to style the template without ever touching a single line of code. Many page templates are included with the Invention theme, so you won’t have to create most of your site’s pages from scratch. You’ll also find a feature-rich portfolio to showcase your previous work elegantly, a gallery to present your photos, social media integration and beautiful sliders to highlight your most important content on the main page. The Flawless theme is appropriately named because it looks perfect on any type of device. 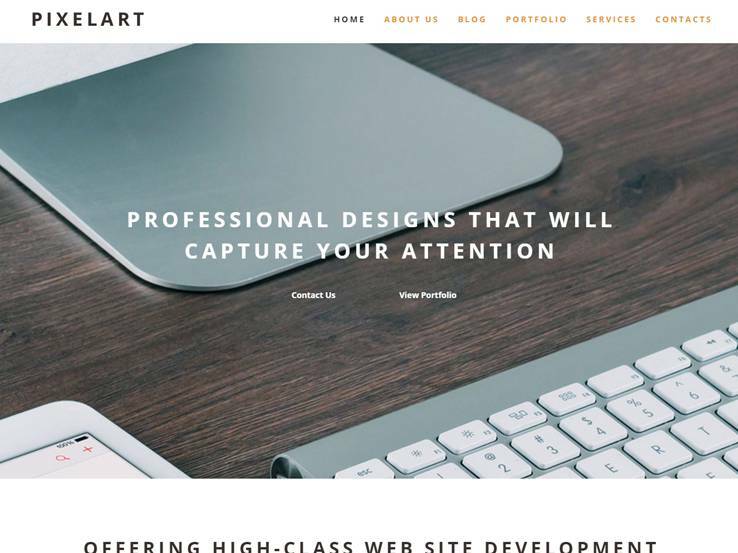 Another responsive multipurpose theme on this list, the template offers many great features that are easy to customize according to your specifications. It comes with several demo designs, which can be easily imported in one click thus saving your precious time. Another great feature of the Flawless theme is the background video support, which you can assign to your sections or the Layer slider. 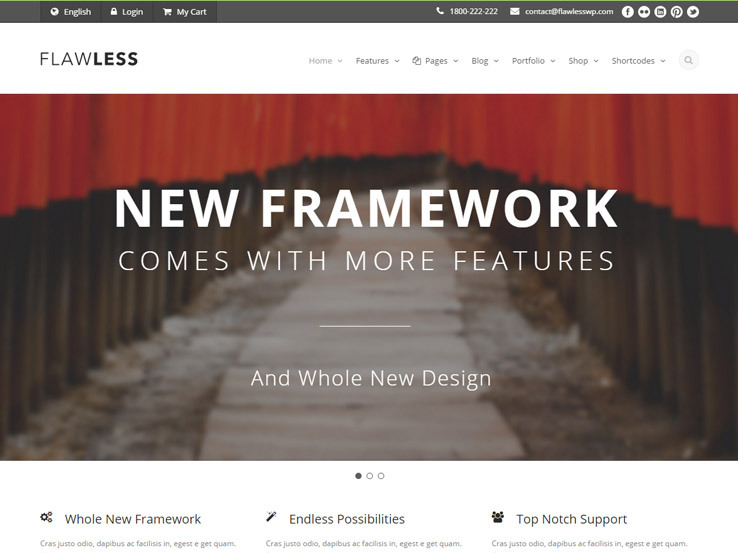 Along with portfolios, eCommerce support, unlimited color options and many page templates, the Flawless theme is a solid choice so check it out today. 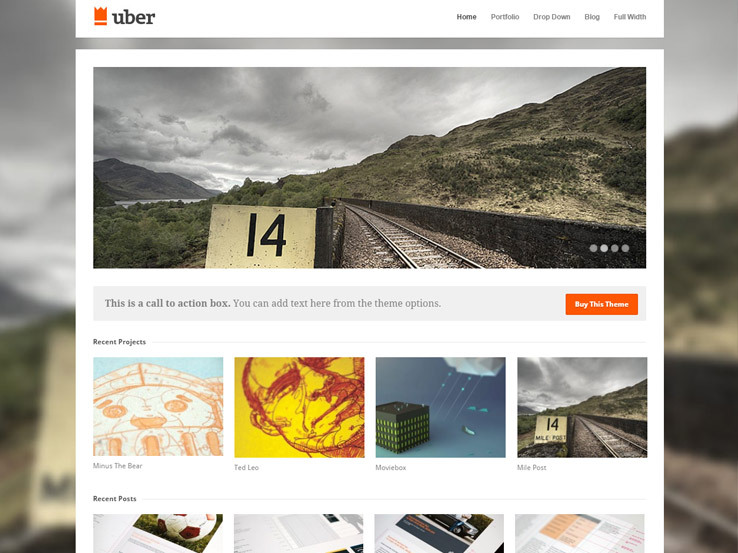 Uber is a clean and simple WordPress theme perfect for presenting your portfolio. The template is fully responsive, with all elements snapping right into place on mobile devices. The homepage contains a beautiful slider at the top to highlight your most important, while your recent projects and posts are presented in various grid layouts. The Uber theme supports custom backgrounds, and you’ll also find a client section where you can display client logos and increase your credibility. Besides, the footer includes a Flickr feed and more space to add important site information. From Press75 comes Clean News, a simple WordPress theme that aims to make it easy for users to access your content; whether on smartphones, tablets, or large desktop screens. Suitable for blogs, magazines and news sites, the template features an elegant homepage design that can accommodate many of your blog posts without looking clunky. A large header image area welcomes visitors on the main page, and your latest posts are displayed in a nice grid layout. We love how social media friendly the Clean News theme is – it has a floating social sharing bar, and other more social media icons are scattered around the page. The slide-out menu looks stylish, and it’s perfect for mobile display considering it saves vital screen space as it only appears when a visitor needs it. Want your portfolio to stand on across all devices and screen resolutions? Consider the Infinity theme. It looks amazing with a clean, minimalist design that has a vertical navigation menu and the homepage featuring your portfolio in a slick grid style. 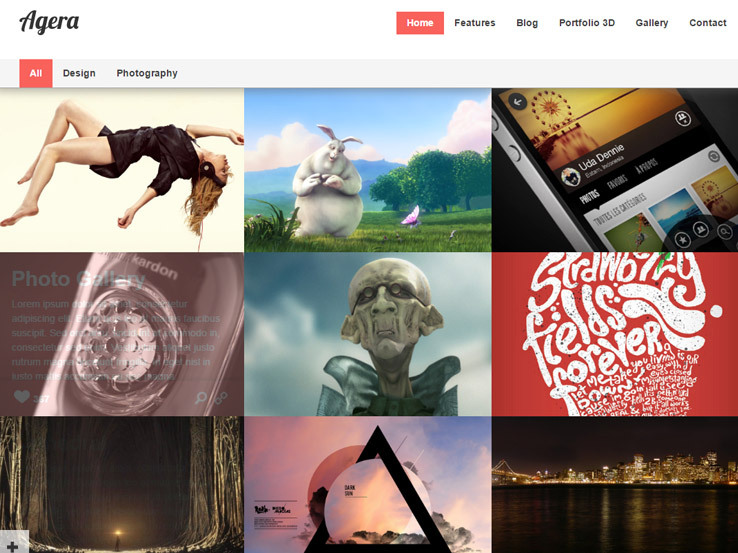 The portfolio is filterable and has beautiful hover effects. 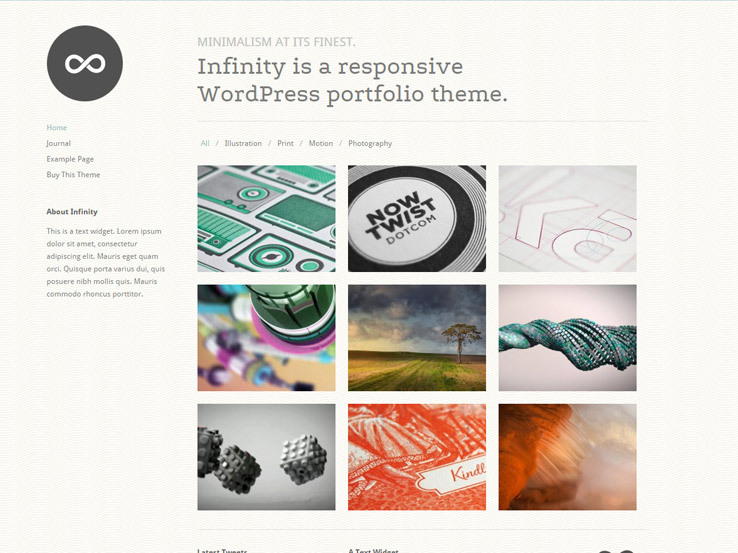 In addition, the Infinity theme includes a simple blog with infinite scrolling for the blog posts. Use the blog to share valuable content and generate more traffic from search engines and social media. You’ll also find video support, translation options, contact forms, Google fonts and a feature-rich theme options panel. The Megamag theme was designed for online magazines, and it has a fully responsive design, a powerful reviews system and 6 pre-made skins to choose from. The frontpage slider looks awesome, and it’s perfect for highlighting your best content. The theme comes with many social media options – you’ll find social icons and Facebook, Twitter as well as Flickr feeds. Additionally, the Megamag theme is highly customizable, so you can easily modify it to match with your style. You’ll find 13 custom widgets and 6 widget areas, custom background options, translation tools, and lots of shortcodes to add things like tabs, toggles, buttons, alert boxes, and more. 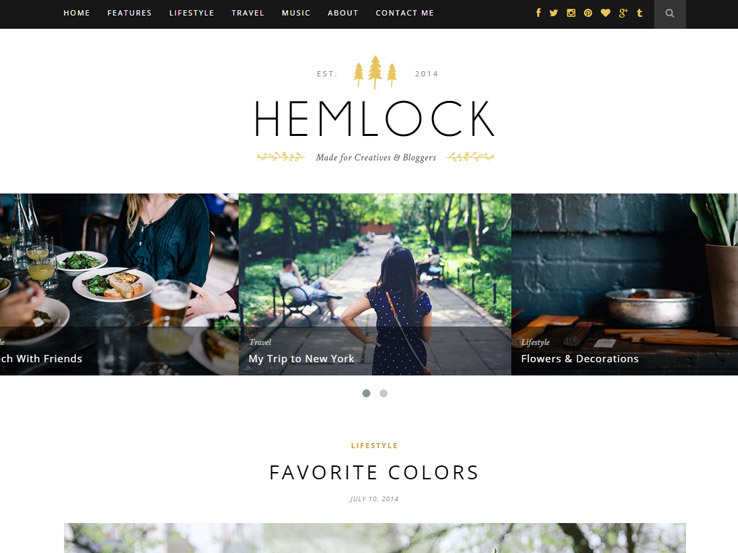 Hemlock is a beautiful and simple blog theme with a responsive design that makes it perfect for mobile browsing. It comes with many useful features and options, including 4 homepage layouts, a full-width featured posts slider to highlight your important content, and social media integration. Support for post formats means you can easily create standard posts, video, gallery as well as music posts. Translation tools are included with the template, so you can display your blog in different languages. Moreover, there’re lots of customizable color options and several custom widgets – about me, Facebook, latest posts, and Instagram widget among others. 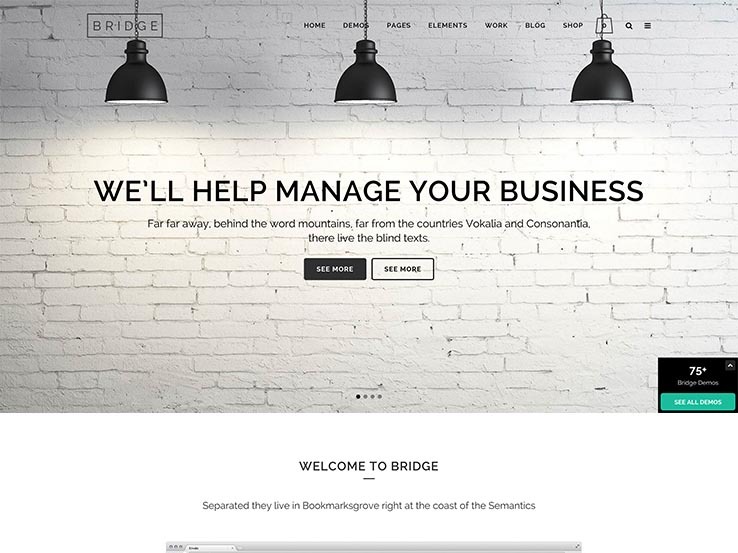 Consider the Bridge theme if you want a large selection of premade layouts or if you can’t find a theme that would suit your niche. With over 200 premade demos, you’re sure to find a beautiful layout that will attract the attention of your mobile visitors. The theme includes over 500 shortcodes which allow you to add various elements such as buttons, accordions, lists, and more and the best part is that they adapt perfectly to smaller screens such as tablets and phones. Social media integration is included so even mobile visitors can share your wonderful content and AJAX transitions will animate elements without any problems across a range of devices and browsers. Visual Composer plugin will help you customize any page layout and Layer Slider will help you make beautiful sliders that scale for smaller screens. Take advantage of numerous customization options such as colors, fonts, and more to integrate your brand and make use of 24 video tutorials should you need any help in setting up your website. 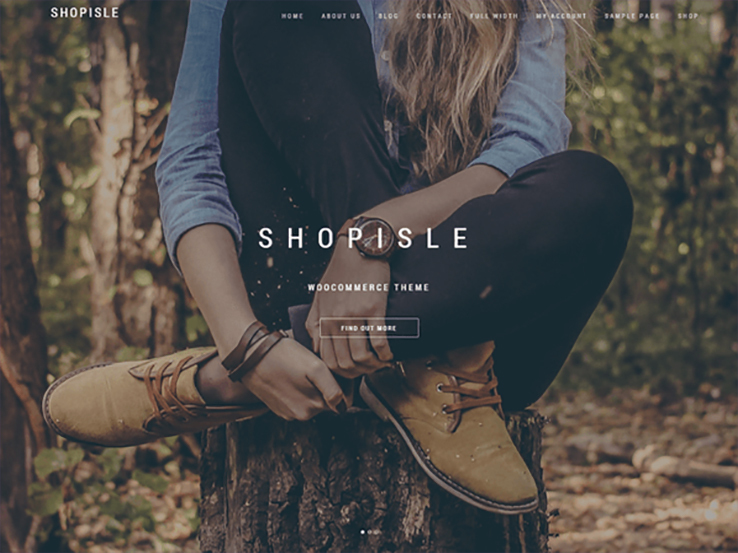 Shopisle is a gorgeous eCommerce theme with complete WooCommerce integration. The theme is fully responsive which is essential when it comes to online stores. Many people shop from their mobile phones so it’s essential to provide them with an interface where they can see all the information and enter their financial information without any issues on smaller screens. ShopIsle theme provides exactly that. The header area features a beautiful slider which is perfect for showcasing your latest products and the homepage itself has various grid layouts to display all the products from the shop. Individual product pages look wonderful on tablets and phones and the checkout process is a breeze. You can also include a blog to share content and drive traffic to your website while boosting your SEO at the same time. Change the colors and the fonts to match your brand and even translate your website into another language for all the foreign buyers. The best part? This theme is completely free! The FlatMobile WordPress theme is a wonderful theme to take into consideration because it has a beautiful responsive setup that glides around and looks super smooth compared to the many other WordPress themes I have looked at. The mobile menu is consolidated to the side, leaving it up to the user whether or not they want to go somewhere else on the website. In addition to that, you’ll notice that the most important content is generally placed towards the top of the mobile interface. For example, you could put contact information, a logo, and your first blog post right at the top. This seems to be best for bloggers out there who know that they are going to have lots of mobile visitors. In addition to the sleek responsive design, the FlatMobile WordPress theme has a wonderful page builder so that you don’t have to worry about touching any source code along the way. The Revolution Slider plugin comes with your purchase, meaning that all of your sliders are going to look incredible when viewed on a mobile device. That’s right, Revolution Slider creates mobile-friendly sliders, so even the mobile users can see images and promotions in your slider. 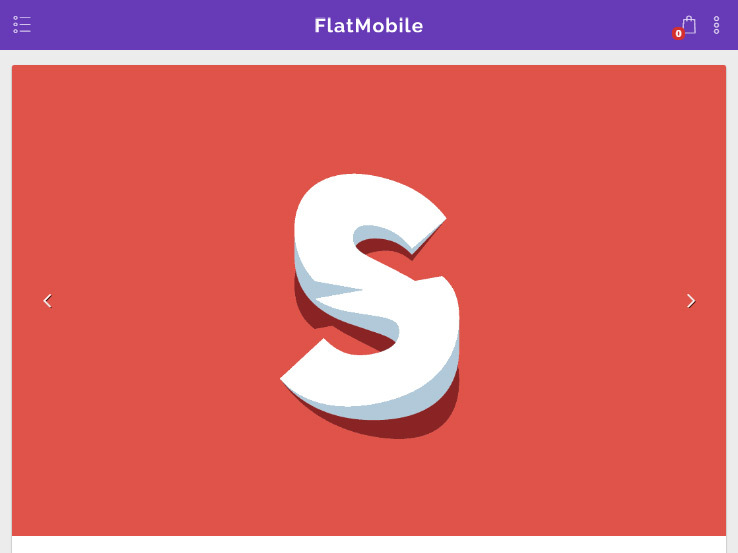 The FlatMobile theme includes double side panels, allowing for more content on a single page. The WooCommerce integration comes in handy if you’re trying to sell digital or physical items and each one of the products you sell will show up nicely on the mobile display. The speed scores are rather incredible, meaning that you won’t get penalized by the search engines and users are more likely to stick around. Integrate with your desktop theme or use this primarily for the mobile layout. The strong options panel has tools for everything from a logo to fonts and colors. Branding is a breeze with the backend and you shouldn’t have to worry about any type of coding. Live customization is done on the fly, so all of your changes are immediately seen on the frontend. If you’re a more advanced developer, consider using the custom CSS module for the ultimate customization. Several custom widgets are included with the FlatMobile theme, expanding the number of items you have to drag onto your website. 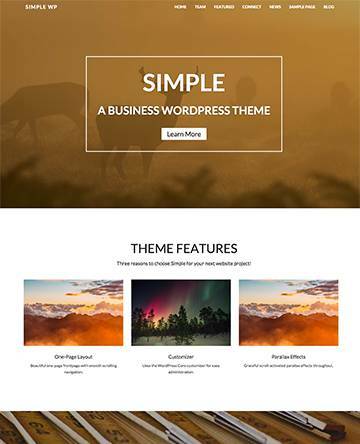 Overall, this is a beauty of a theme, so test it out today and see if it works for your business. Consider the Rogue theme if you’d like one of the most customizable mobile themes on the market. As with many of the themes on this list, this one is primarily for making a beautiful mobile website. The menu system is one of the best we’ve seen and you can pretty much develop an unlimited amount of colors and designs for your menus and pages. The page transitions are customizable as well, meaning that each time someone clicks on a new page they will see a quick transition, making it seem like the process is going a little faster. The customizable header, title, and font sizes are just a few of the items you can play around with on the WordPress dashboard. If you have any problems along the way, the theme comes with some great documentation for checking in on what you may be doing wrong. Shortcodes are rather powerful with the Rogue theme. You can make anything from video to buttons, all with a little snippet of code. Since shortcodes are included you don’t need a fancy development degree to make your site look professional. All of the layouts have been tested on all major browsers, which is a must considering this is a mobile theme. 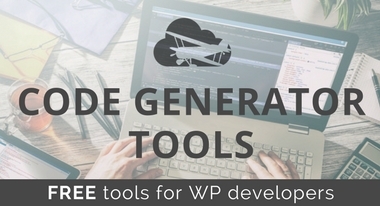 The widgetized footer is a bonus for those who like to play around with widgets and the translation tools are essential for connecting with people who don’t speak your language. The touch-enabled gallery is exactly what you need to display a portfolio or image gallery on your site. As an example, you may want to develop a mobile portfolio for your freelancing business. If that’s the case, sending a link to a potential employer is easy. Then, that employer can scroll through the images without any problems. The integrated comments are ideal for chatting with your customers or readers, while the beautiful contact form has the functionality for people to quickly send you a message. With all of these features, the Rogue WordPress theme is a highly desirable option. Along with support for all media and some interesting colors, you can’t go wrong with this theme. 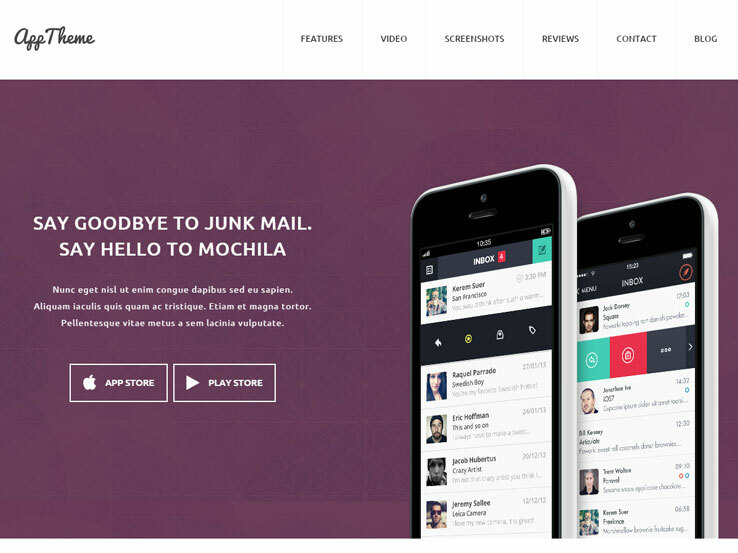 The Dzonia WordPress theme is all about the mobile phone setup. It has layouts for niches like movies and non-profits, making it a superior theme when you’re not sure exactly what type of business you’re going to need the theme for. We like it for developers, considering you can’t always expect to bring in clients from the same industries. The theme comes with the Awesome Slider plugin, which makes it possible to connect with your customers through a beautiful photo slider that works wonders on mobile devices. The theme has a completely responsive layout, encouraging search engines to index it and users to stick around. The styling options are fairly powerful and you can manage them all on the backend. The full documentation makes it easy to find help if you run into any problems with the theme setup, while custom templates and widgets ensure that your website looks different compared to various other people who choose the theme. Social icons are great for reaching out to people on other platforms. After all, most people are not going to keep coming to your website for new content. They are more likely to hang out on a place like Facebook in order to see the articles you’ve shared on your blog. Dzonia has strong support for videos and you can even feature a video on your homepage if you’d like to show a personalized message to your visitors. The light skin colors are adjustable, while the one-click auto installation means that you don’t have to spend much time getting the website up and running. Various templates are included with your purchase. A contact form template is provided along with a gallery template. Visual blogs and business websites work well when using the Dzonia WordPress theme and custom logos and favicons allow you to brand your site exactly the way you want. 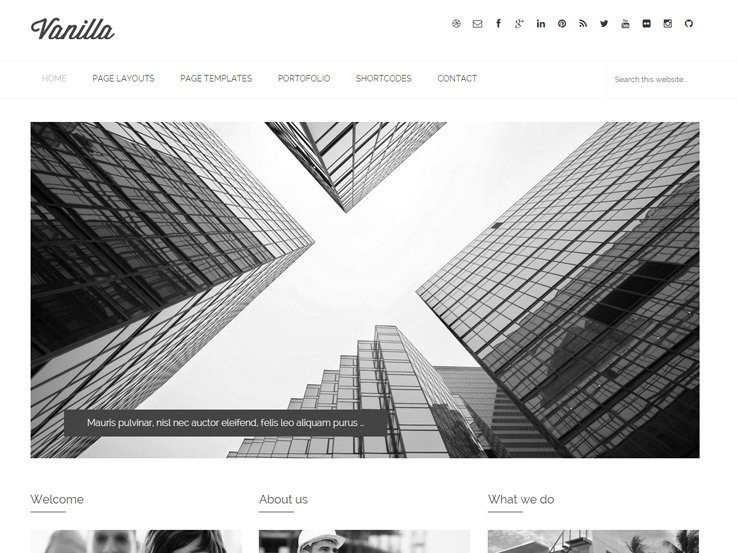 Along with multiple sidebars and three widget areas, the Dzonia WordPress theme stands out as one of those themes that everyone should at least test out for their own use. It even includes a background image area for rounding out the branding that everyone is going to see when landing on your website. Check out the theme, and be sure to play around with the frontend on a mobile phone or tablet. This will give you the best real-world experience before paying for the theme. The AppTheme comes from MyThemeShop, and it’s fully responsive, adapting perfectly to all devices and browsers. Use it to showcase you app or to present your portfolio, services or testimonials. The template is easy to use, and it comes with plenty of amazing features, including carousels to display app screenshots, customer reviews, and a slide-out mobile menu. You can customize every aspect of the Apptheme – it offers many customization options, including unlimited colors and backgrounds, hundreds of Google fonts, custom widgets as well as the option for custom CSS for those with advanced web design knowledge. Along with contact forms, custom sliders, parallax effects, social media integration, and a blog section, the Apptheme is a reliable option so be sure to give it a test-drive. 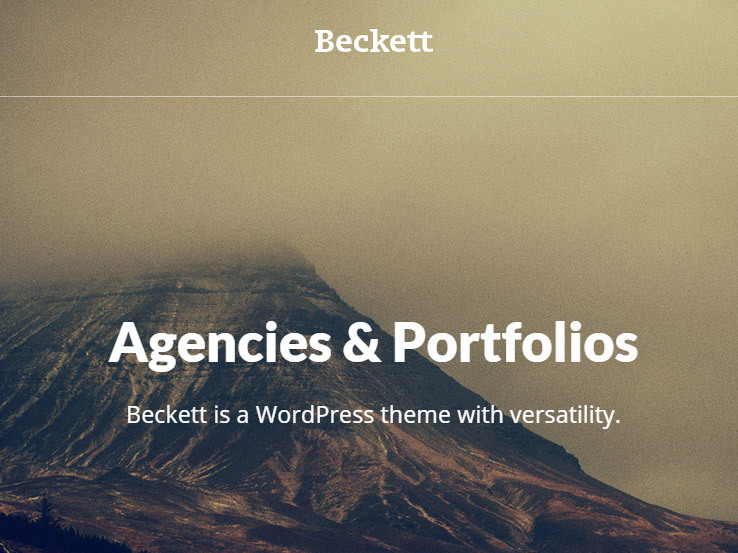 Meet Beckett, a clean and professional WordPress theme from Themetrust. It has fully responsive and minimalist design that puts the focus on your content; whether on smartphones, tablets, laptops, or large desktop screens. 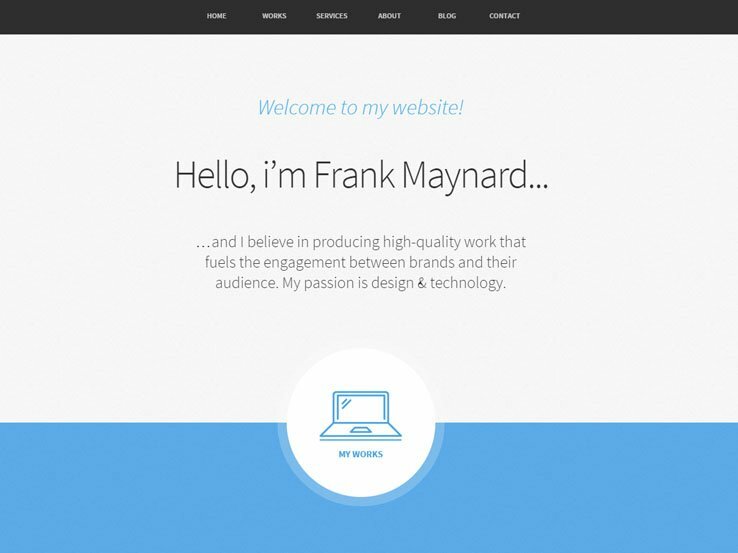 You can use the template to launch your online portfolio or to create any kind of business site. Besides, the theme options panel has a user-friendly design, and it allows you to make many different customizations, including setting your own logo and colors to make your site unique. 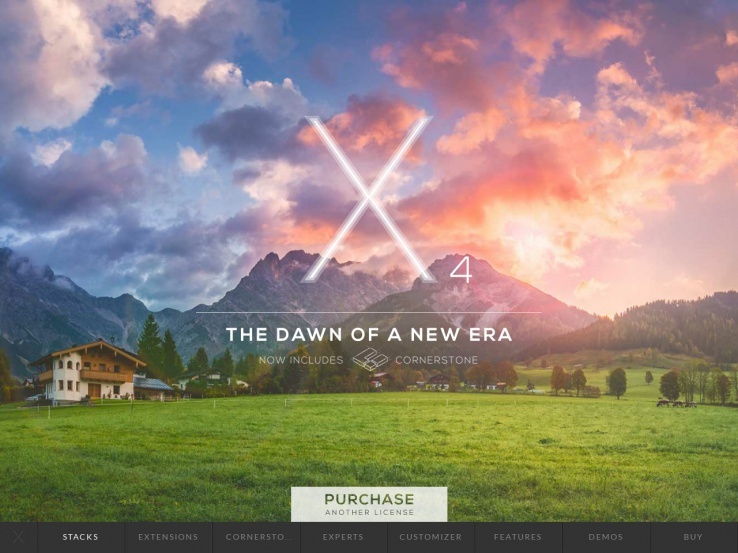 The X theme is one of the most popular WordPress themes in the market. It comes with multiple designs, which are fully responsive, so your website will always look beautiful and work correctly on all device types. A highly impressive feature of the X theme is the large number of premium extensions that your purchase grants you access to. These will help you expand the functionality of your site and empower you to create virtually any type of website you imagine. Furthermore, the template comes with an advanced and intuitive page builder, so you’ll be able to create beautiful layouts of your own without ever touching code. The customization options available are impressive as well, and they integrate with the WordPress live customizer, which allows you to see live previews of the changes you make to your website. 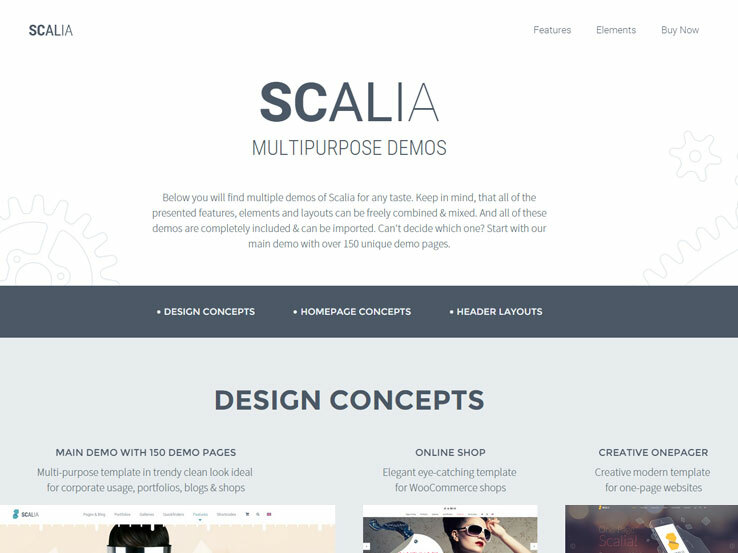 Scalia is a responsive, multipurpose WordPress theme that can be used to build pretty much any type of website – from corporate sites and portfolios to blogs and eCommerce sites; you’re only limited by your creativity. It comes with 5 unique in-built designs, which look great on any mobile device and screen size. Choose from over 100 unique page templates, over 8 blog styles, a bunch of portfolio layouts, multiple gallery options, beautiful shop pages, and much more. The header layout options allow you to make your website unique, while a drag-and-drop builder makes it possible to create your own custom page layouts without ever touching a single line of code. Along with that, you’ll find in-built mega menus, translation options, unlimited fonts and colors, extensive documentation and superfast support from the theme developers whenever you need it. Reveal is a WordPress portfolio theme designed with a responsive layout that lets you present your work elegantly on any type of device or screen size. The clean and minimal design makes it easy for users to focus on your work. The portfolio is Ajax-powered, which provides for smooth hover effects and makes it possible for people to filter your portfolio items without re-loading the page. The Reveal theme allows you to embed videos from platforms like Vimeo and YouTube, and you can also translate your site to different languages. Along with contact forms, Google fonts integration, shortcodes, and a powerful theme options panel, the Reveal theme is worth checking out. 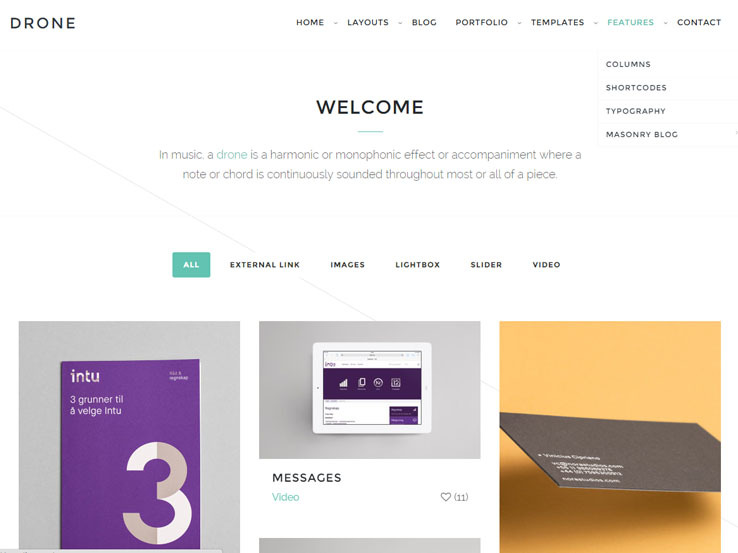 Designed for creatives, the Story theme boasts of a clean, sharp, and modern design. As expected, the template has a responsive design, so your site will fit and look great on all types of devices. It comes with two front-page styles – fullscreen slider and full-width page – and there’re several home layouts to choose from. All these demos can be installed in one click, meaning you can have your site up and running within minutes. 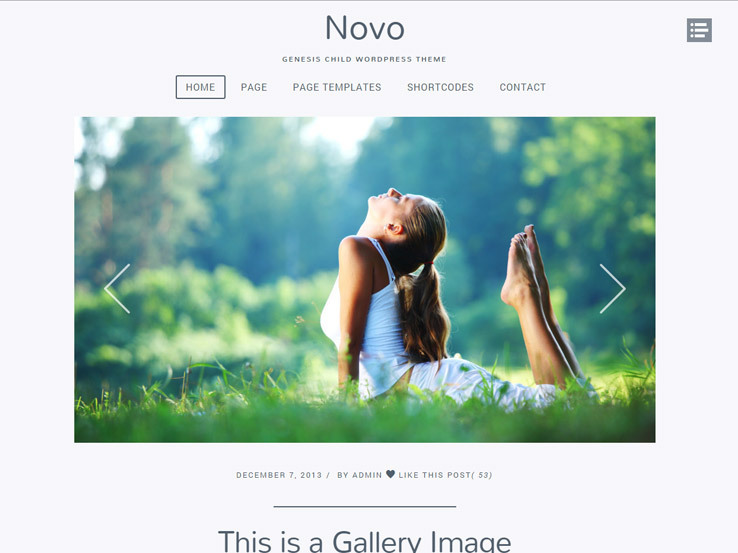 The theme’s gallery and portfolio are quite powerful as well- they’re Ajax-powered and include multiple columns and layouts among other beautiful features. Besides, the Story theme comes with Woocommerce support, custom header and background sections, social media integration, a feature-rich blog, and much more. Consider the Mellow theme if you want a clean, minimal, and professional-looking portfolio website to present your work online. Designed with a responsive layout, the template features a powerful portfolio module that has attractive hover effects and makes it easy for users to filter your work. The slide-out menu only appears when clicked on, which is great especially on smaller screens with limited space. The Mellow theme includes a blog for sharing valuable content and generating more traffic to your portfolio. In addition, it supports localization for those who want to display their sites in different languages, and you can also embed videos from Vimeo and YouTube. Along with that, you’ll find hundreds of Google fonts, a user-friendly theme options panel to control your website, and shortcodes to easily insert elements like buttons, toggles, columns, slideshows and tabs. 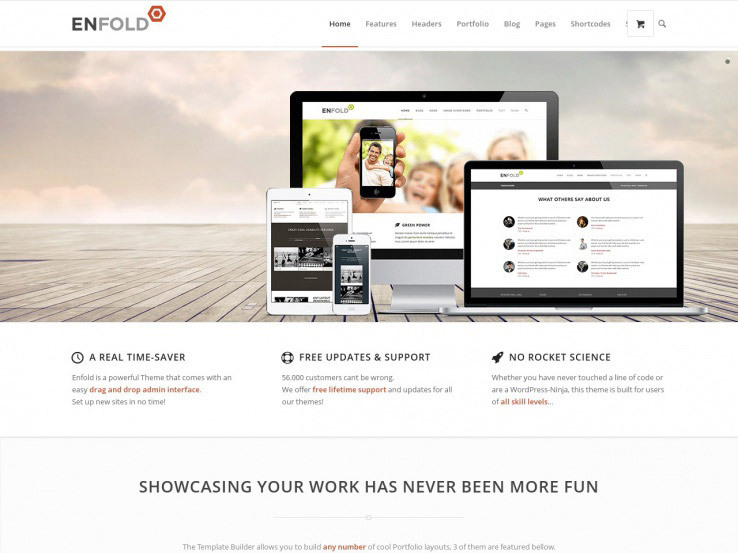 Enfold is a top-selling theme with a unique mobile menu, a responsive design that adapts perfectly to smaller devices, and lots of mobile options. The theme comes with many demo designs that make it easy to create different types of websites, including business sites, portfolios and eCommerce stores. One of Enfold’s most impressive feature is the innovative drag-and-drop builder, which unlike many others in the market offers live previews when you create your pages. Other notable theme features include an Ajax-powered instant search function, translation support, multiple slideshows, unlimited color options, video support, post formats, and advanced typography options. Brutal comes from Zigzagpress, and it has a mobile-friendly design that delivers a smooth and seamless browsing experience on smaller devices and screens. 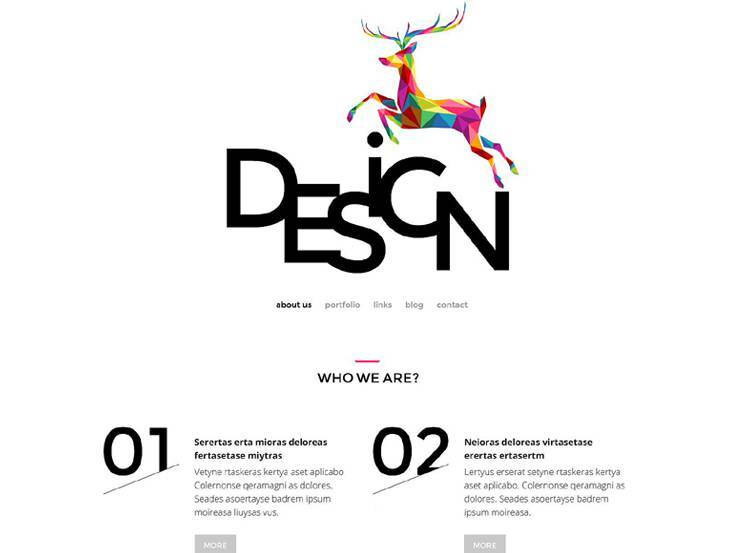 The modern and versatile theme can be used to build a wide range of websites, including eCommerce, portfolios, corporate and business sites. The theme options panel is easy to use, and it lets you control the template’s features without having to touch code. Besides, the Brutal theme is optimized for search engines, and you can easily translate it to any language you prefer. Last but not least, you can use the theme on as many domains as you need. 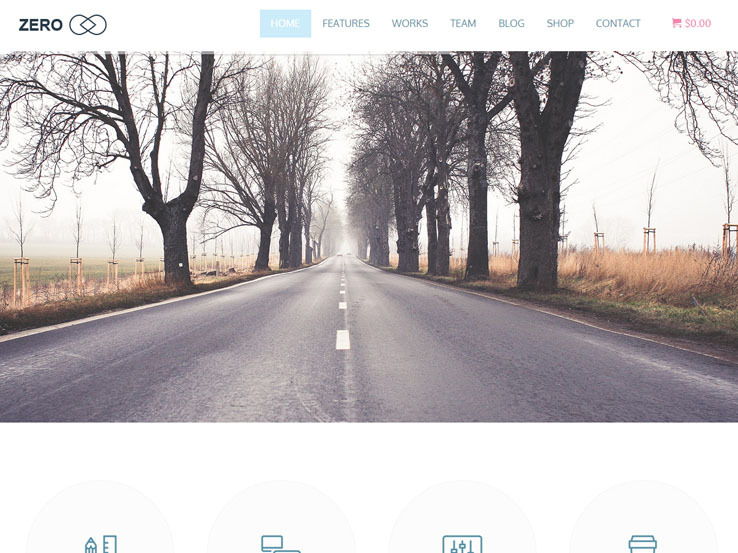 Port is another modern and stylish theme from Themetrust designed with responsive layouts. Perfect for agencies who want a stylish website to establish their online presence, the theme features a mobile-friendly slide-out menu, beautiful parallax sections, and localization support. On the homepage, you’ll find sections to present your services, team members and past works as well as a high-impact call-to-action section that’s sure to boost your conversion rates. Along with an easy-to-use theme options panel, video support, Google fonts and shortcodes, the Port theme is a solid option for agencies and businesses. Jupiter is a popular multi-purpose WordPress theme being sold on the Themeforest marketplace. 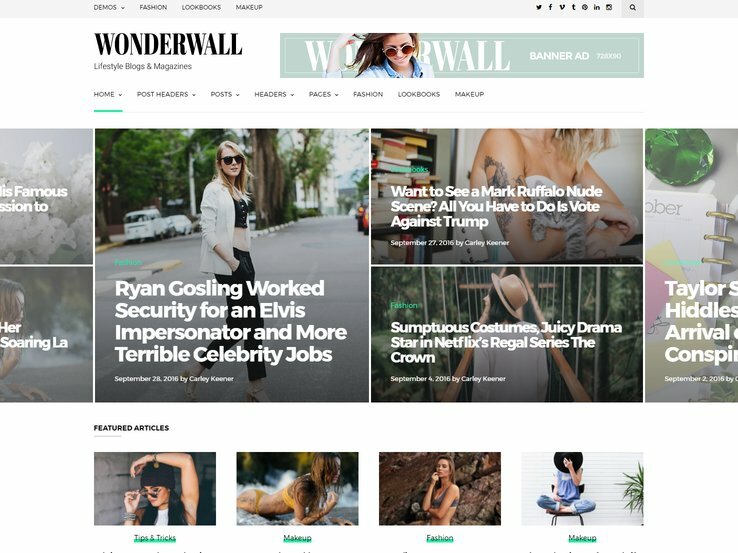 The responsive and Retina-Ready template ships with over 100 pre-made website templates, an advanced page builder, 18 header styles to help you achieve a unique look for your website, 10 custom post types and 7 unique blog styles to choose from. You’ll love that the template was created with a focus on performance, meaning your website will be fast-loading and enjoyable to browse for both humans and search engine crawlers. You’ll also find multi-language support, an advanced portfolio, stylish navigation options, and tons of customization options to make it your own. 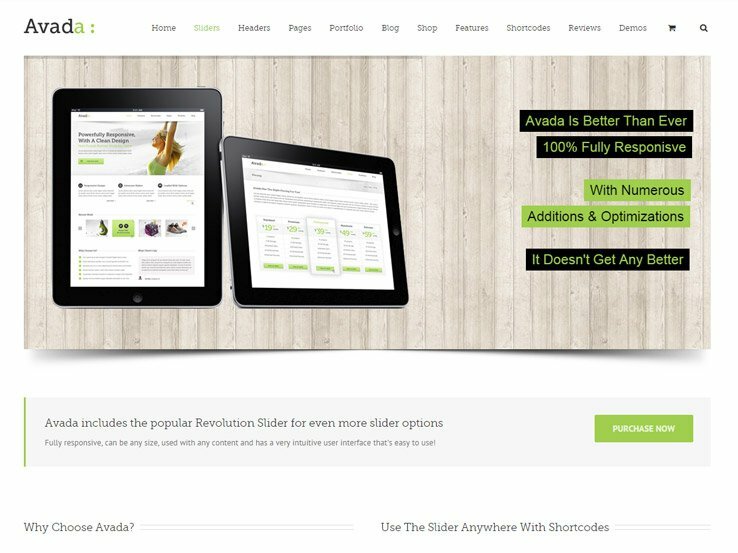 The Avada theme is a bestseller on the Themeforest marketplace, with over 350k downloads at the time of writing this post. The theme offers unlimited designs and customization options that allow you to create any kind of website even without coding knowledge. It comes with loads of demos which can be installed in one click, a powerful website builder for creating your own custom layouts, eCommerce support, portfolios, gallery options, and much more. The best part is that all elements look incredible on any device, so your visitors on smartphones and tablets will always enjoy a seamless browsing experience. You’ll also notice that Avada includes several premium sliders for free, advanced header options, translation tools, parallax effects, and everything else needed to create a modern, effective website. 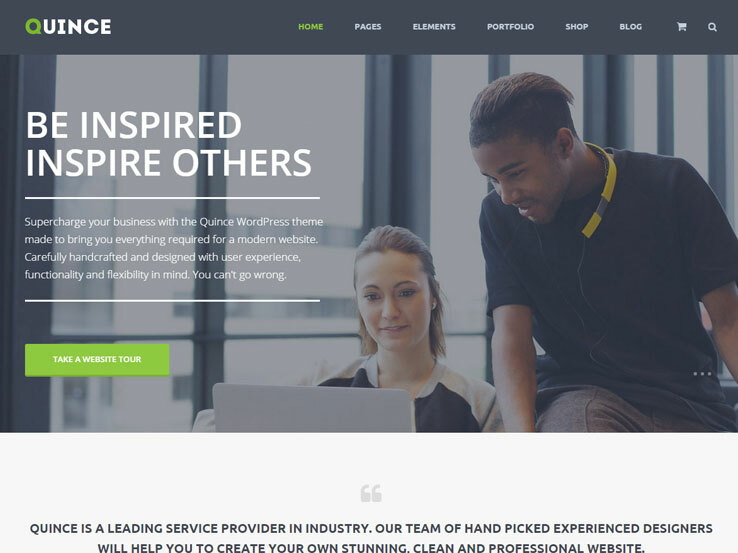 OnePage is fantastic single page WordPress theme for business sites and portfolios. Built by the folks at MyThemeShop, the template features a professional and well-organized layout with different sections for things like services, team member bios, pricing tables, portfolio, testimonials, clients as well as a contact section at the bottom for potential customers to easily get in touch. The fully responsive design means people will have no problem accessing your portfolio and business information on tablets and smartphones, while clean code ensures your website is fast-loading and friendly to the search engines. Additionally, you’ll find Google maps integration, beautiful parallax effects, unlimited colors, translation tools as well as a Twitter feed that will help your site gain more exposure. 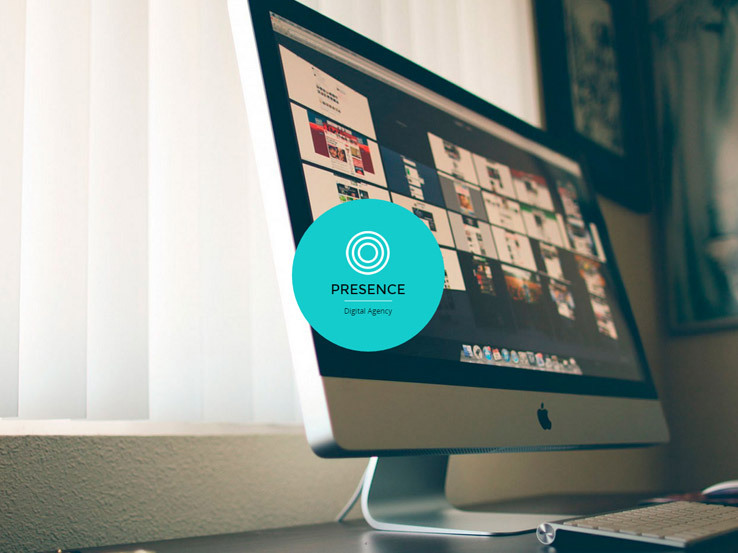 Consider the Presence theme if you want a creative, responsive one-page WordPress theme for your business or portfolio. Based on the Twitter Bootstrap framework, the template looks great on all mobile devices. It comes with 8 homepage styles, so you can always choose a design that matches your needs. As with most single-page themes, Presence includes amazing parallax effects that will add depth to your website, and it also supports video backgrounds and post formats. 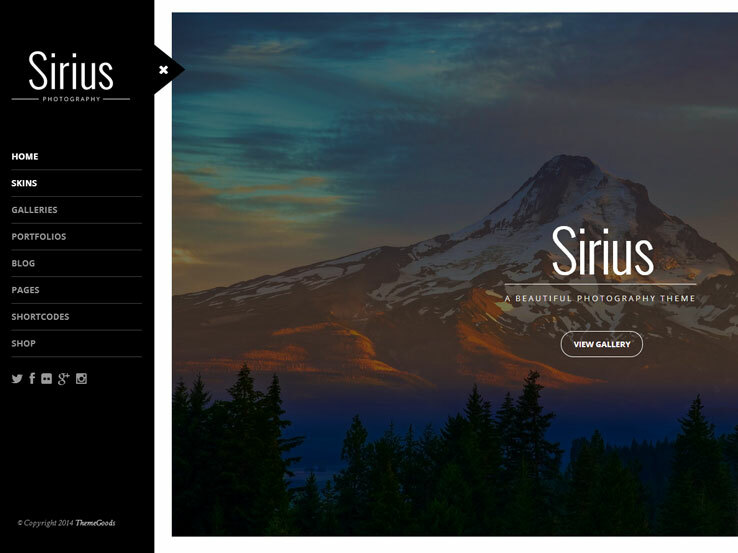 The Sirius theme was created by ThemeGoods, and it offers a beautiful option for photography and portfolio websites. The fully responsive and Retina-Ready template comes with a powerful gallery that has several layout options, a portfolio for presenting your work as well as an online shop. The off-canvas navigation is perfect for mobile devices as it saves vital screen space by only appearing when a user clicks on the menu icon. With the advanced theme admin panel, you can easily customize different elements and sections of your website – colors, layouts, fonts, and much more. 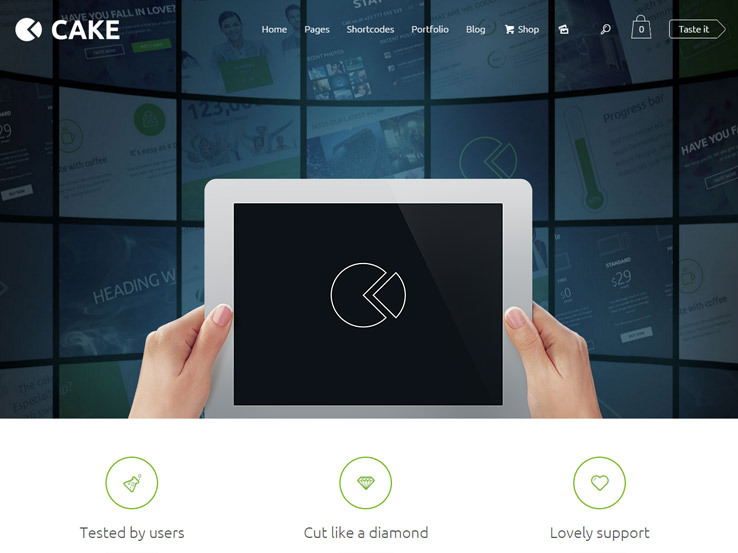 Cake is a modern, minimalist WordPress theme for business websites. It offers unlimited customization options, allowing you to create a truly unique website for your venture. A fully responsive and Retina-Ready design, eCommerce support, an intuitive drag-and-drop page builder and a premium slider are just some of this template’s amazing features. Several homepage styles and page templates are included with the Cake theme, meaning you can have your site up and running within minutes. Besides, the theme is translation ready and social media friendly. Vernissage is a superb responsive WordPress photography theme with a fullscreen design, 11 different gallery styles, a filterable portfolio, custom post types, and many other beautiful features and functionalities. 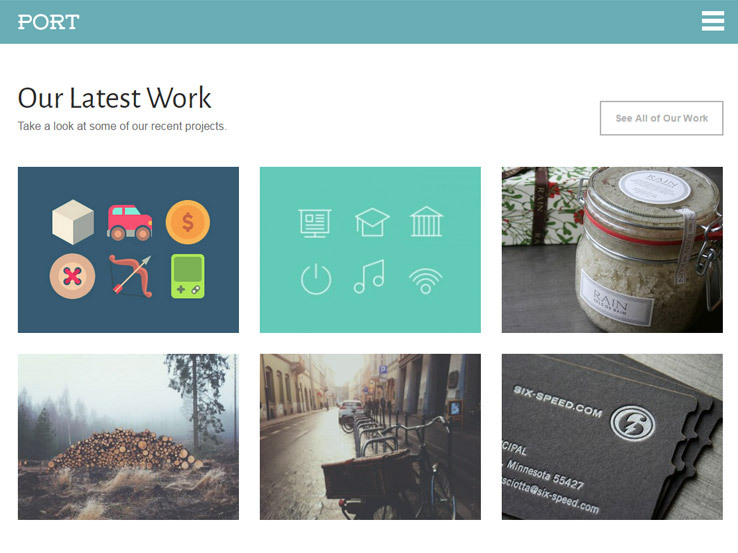 With this template, you get a solid solution to show off you photography skills and projects. Support for fullscreen video backgrounds and a background music player add to the theme’s awesomeness. Moreover, you’ll find a drag-and-drop menu and photo gallery builder that will save you time as well as translation tools to help you reach a global audience. Along with custom widgets, unlimited theme colors and 3 blog layouts, the Vernissage theme is sure to impress both webmasters and end-users. Agera is another responsive fullscreen portfolio theme in our collection. This one is perfect for creatives such as photographers and designers who want a simple yet stylish website to show off their superb work. It is fully responsive and completely fullscreen on all resolutions. The theme comes with two portfolio versions, a gallery that supports both images and video, unique background images, 13 custom social icons, and much more. A custom admin panel makes it easy to style the template, and you’ll also find translation files to help display your site in whatever language you desire. 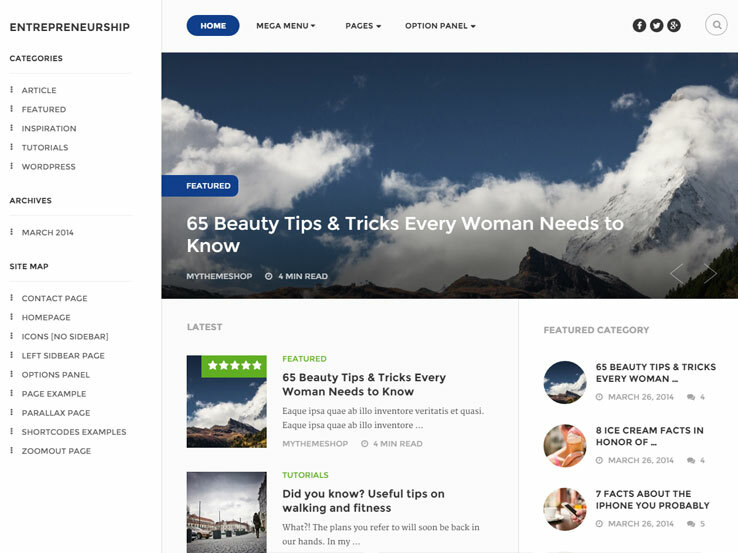 Meet Entrepreneurship, a beautiful WordPress magazine theme by MyThemeShop. The template looks pretty on all devices and browsers thanks to its fluid responsive and Retina-Ready design. As with most themes from MyThemeShop, Entrepreneurship is fast-loading and optimized for search engines, so your visitors will enjoy a great browsing experience and you’ll have no problem ranking high on Google. You’ll also love that this theme is Adsense-friendly, which will help you generate more revenue from your website. Besides, social media integration is included to help you gain waves of traffic from platforms like Twitter and Facebook. And as for customization options, there’s a feature-rich theme options panel that allows you to control all aspects of the template without touching code. 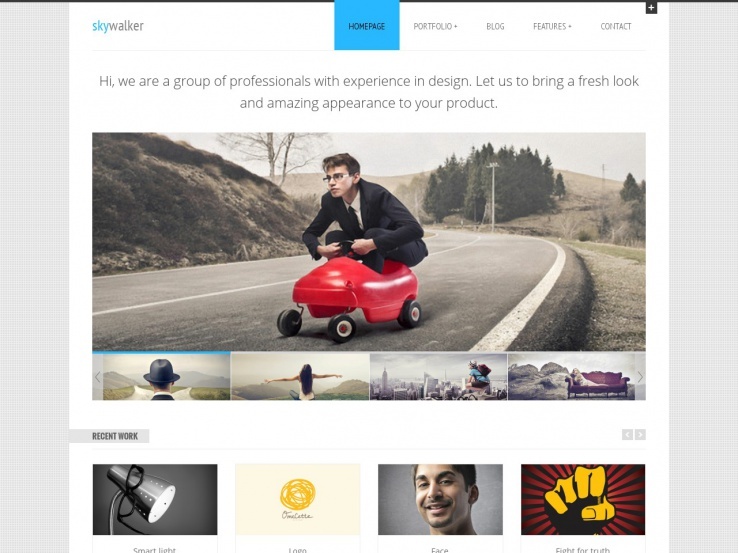 Business is another responsive and fast-loading theme from the wonderful team at MyThemeShop. 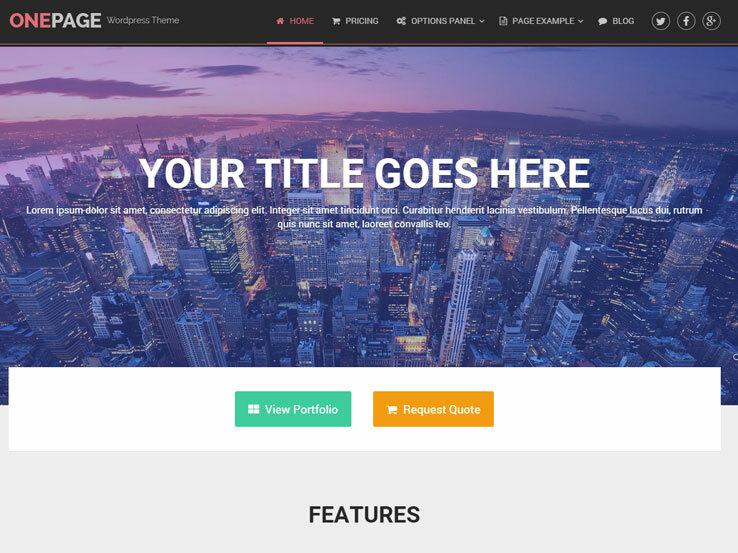 Suitable for corporate and business websites, the template brings a clean and professional design along with a wide range of customizable features and functionalities that will help you get more customers for your business. You can display you contact information at the top, and there’s an elegant frontpage slider to feature your promotions, offers and other important information. We also enjoy the integrated social media buttons as well as the support for WooCommerce, which makes it possible to start selling your products online within minutes. Business’s other notable features include unlimited colors and background options, an animated mobile menu, pagination options, and a working contact form. 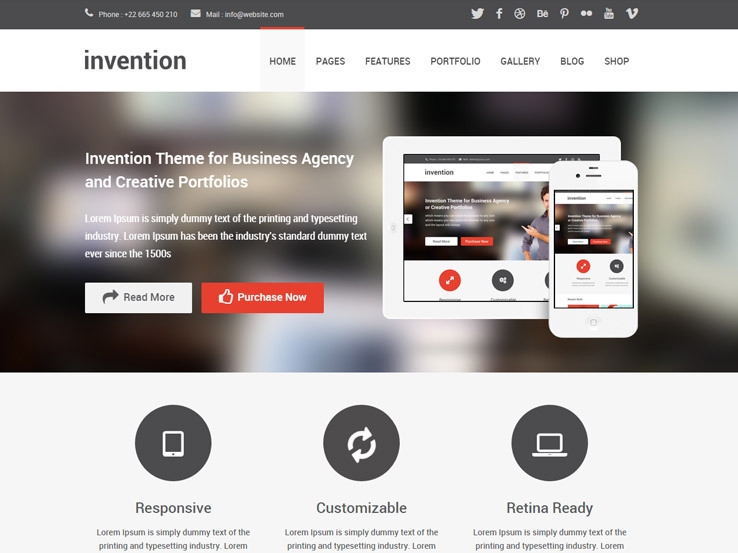 Section is a modern responsive portfolio theme that ships with a variety of custom page and portfolio layouts. It uses a masonry layout that lets your content shine, and categories help filter your content and display only your best posts. The infinite scroll will help people see all your content without feeling overwhelmed. The fluid responsive design ensures that your website looks great on tablets, smartphones and large desktop screens as well. Along with that, you’ll find Google maps support, a shortcode generator, translation tools, a working contact form, and multiple support resources. From Themes Kingdom comes Immensely, a fully responsive WordPress theme that works great for companies, portfolios, agencies, and eCommerce shops. You can modify all aspects of the site including colors, fonts, styling, and layout with the page templates, as well as the drag-and-drop page builder. Google Maps is integrated, .mo/.po files are included for translation, and custom widgets and shortcodes are available as well. Immensely is an all-around win from ThemeFuse! 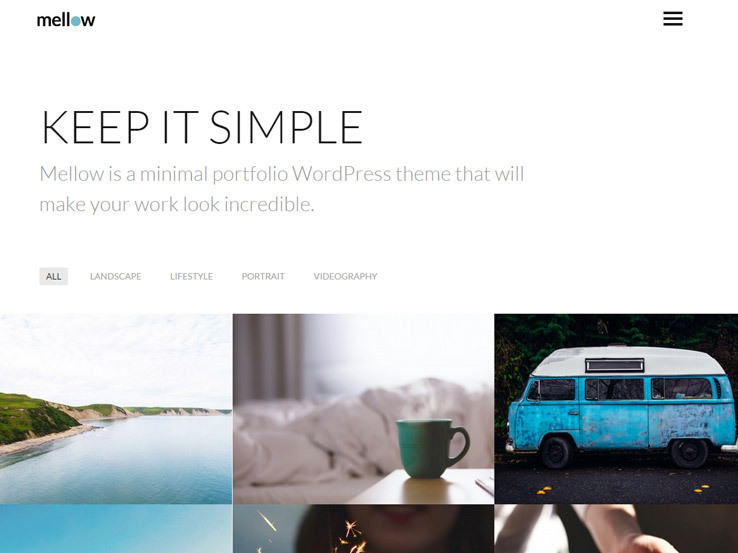 Amazing collection of WordPress themes you have shared with us. Thanks for sharing. Even, users may also take an advantage of using a designing software templatetoaster for making multi CMS based themes in just a matter of hours. 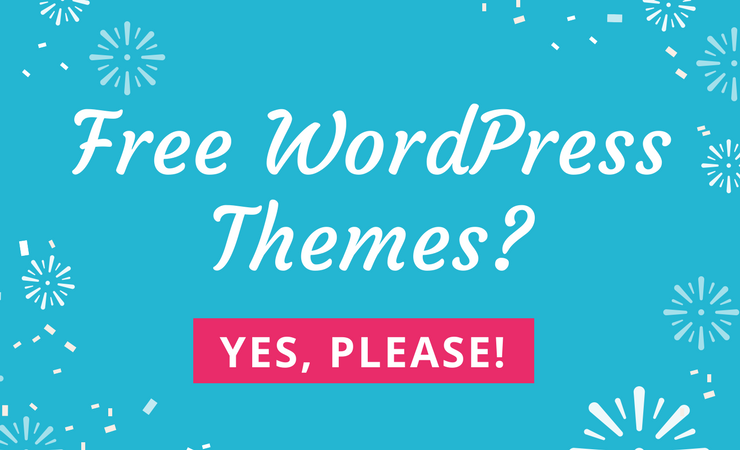 I must say, it’s a huge list of WP themes. Enjoyed reading this. 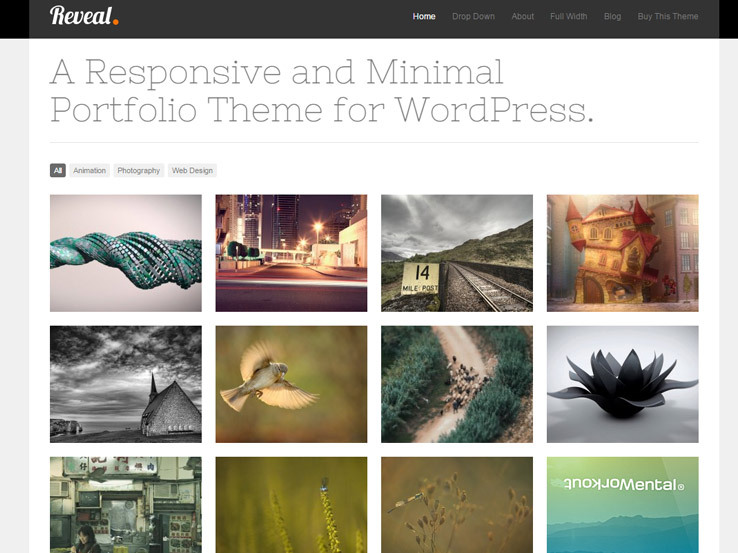 Interesting collection of WordPress themes listed here. I also have used Total and no doubt that Total is a highly rated responsive multipurpose theme that integrates a lot of the functionality that today’s online business needs. Thanks Dinesh, for the feedback on Total. We appreciate it! I am really finding it difficult to choose a perfect one for my new sports blog.. any suggestion? Hi Aranyak,\n You might want to check out our Best Sports Themes to help narrow it down for you. Hope that helps! It’s a huge collection of WordPress themes. My favorite is PixelArt. PixelArt is a great theme, and thanks for the feedback. 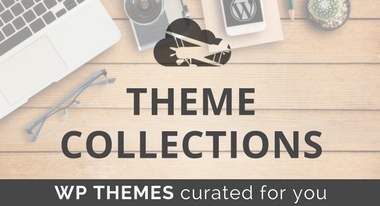 nice collectio of wp themes great job . Really awesome collection. I like DIVI most. It is the best wordpress theme I have seen so far. Thanks man for including this on top. 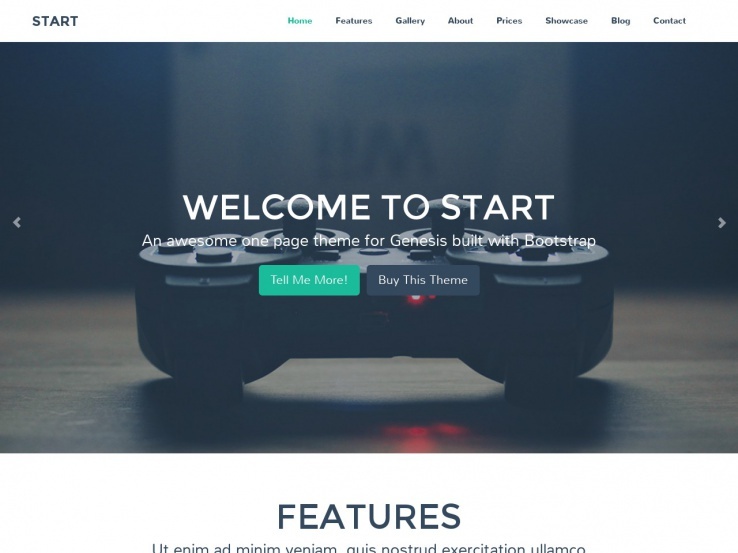 Hi Rayhan,\n Divi definitely exceeds the industry standard for one of the best themes available. Thanks for your feedback! I must say the best collection ever of Responsive WP themes.